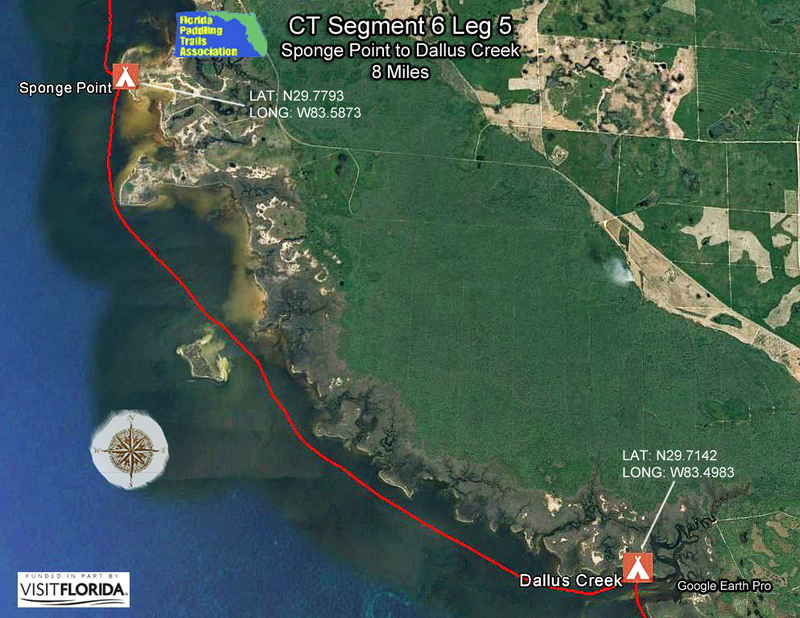 FPTA paddling trails are divided into 15 regions with a total of 32 segments. 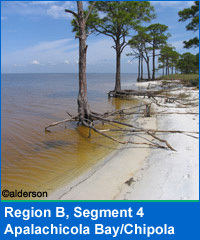 Regions begin at Big Lagoon State Park near Pensacola, extending around the Florida peninsula and Keys and continue up the east coast to Fort Clinch State Park near the Georgia border. 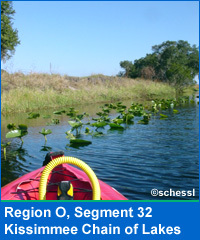 Interior regions cover the Suwannee River, Ocklawaha and Wekiva Rivers and lakes in Central Florida. Our paddling trails include every type of Florida habitat, from swamps to barrier island dune systems to salt marsh and mangroves. You can explore the trail online by scrolling down and using the links below, or better yet, grab your kayak or canoe and explore the trail up close! 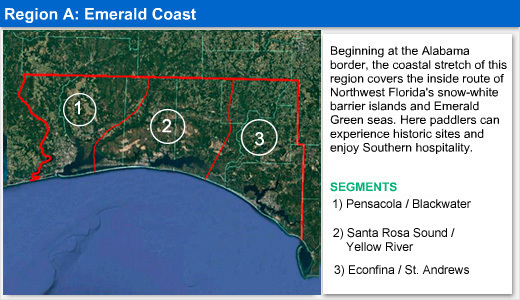 A: The Emerald Coast. Beginning at the Alabama border, the coastal stretch of this region covers the inside route of Northwest Florida's snow-white barrier islands and Emerald Green seas. Here paddlers can experience historic sites and enjoy Southern hospitality. 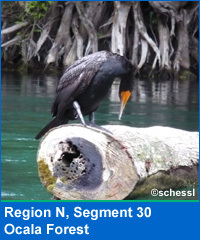 This region also has a wealth of unspoiled rivers, including the Perdido, Coldwater, Blackwater, Yellow, Juniper / Sweetwater, Shoal, Holmes Creek and Econfina Creek. 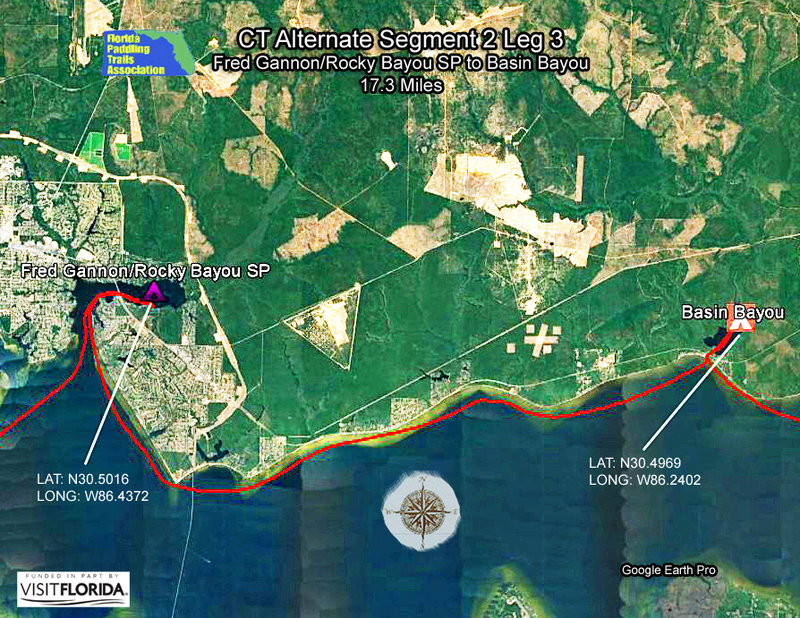 Bordering the Florida-Alabama state line, this segment encompasses several outstanding rivers and it marks the beginning of the Florida Circumnavigation Saltwater Trail at Big Lagoon State Park. The almost 700-acre park offers hiking trails and a top-notch campground. Before beginning your adventure on the trail, be sure to climb Big Lagoon's observation tower for a good look at Perdido Key and outstanding examples of upland coastal marsh and forests. 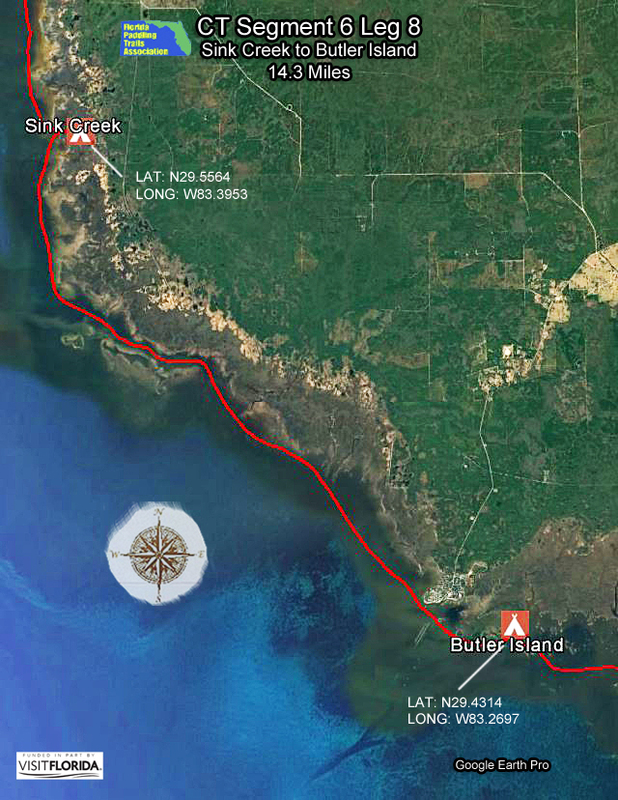 After leaving Big Lagoon, the circumnavigational trail traverses the Fort Pickens Aquatic Preserve, which consists of 34,000 acres of seagrass beds, salt marshes and the undeveloped portions of Perdido Key and Santa Rosa Island. 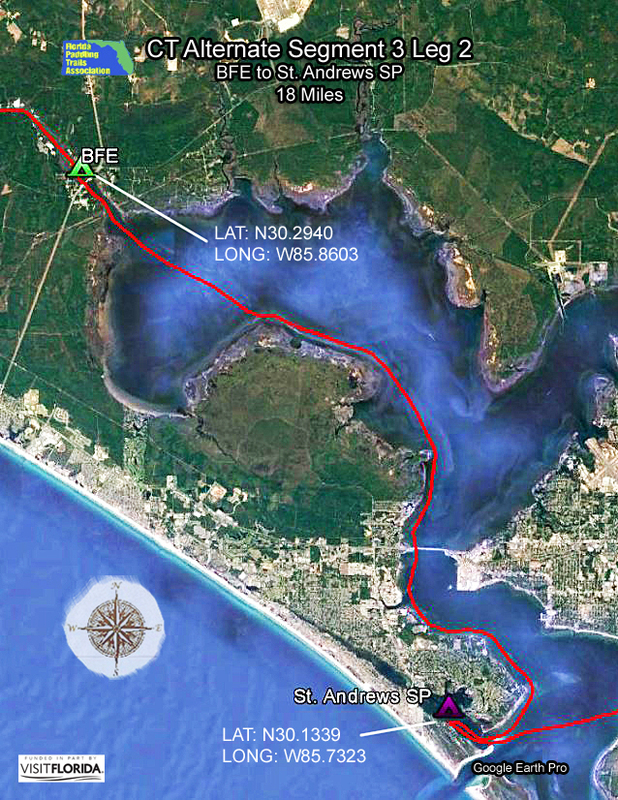 Paddling past the historic Fort Pickens and Gulf Islands National Seashore Naval Live Oaks Visitor's Center, this segment of the trail terminates at the Navarre Beach Bridge, some 35 miles later. For river paddling, this segment includes four scenic state designated paddling trails: the Perdido, Coldwater, Blackwater and Juniper Creeks. 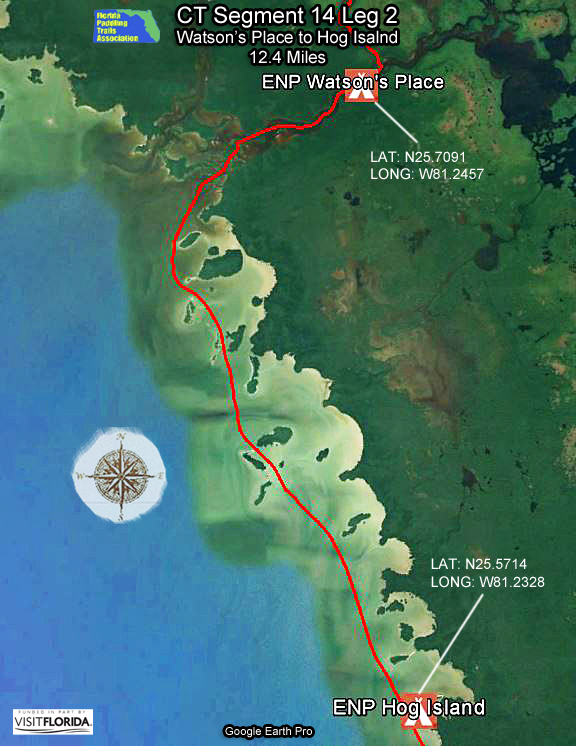 Each offers long undeveloped stretches, numerous sandbars for rest stops and sparkling waters often tinted with yellow or red-black tannins from swamp vegetation, depending on rainfall levels. Contact: Contact our Region A Director or Trailkeeper for more information by clicking here. 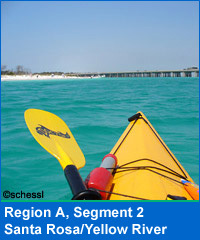 Coastal section is ideal for sea kayaks; canoes or smaller kayaks can be used on rivers. Ah... Santa Rosa Sound on the Emerald Coast. Snow-white singing sands* and emerald green waters. A Northwest Florida paddler's paradise. Here you'll find Fort Walton Beach, playground of the south and Destin, the world's Luckiest Fishing Village. In this segment of the Florida Circumnavigational Saltwater Trail you'll also find 46 miles of paddling bliss. 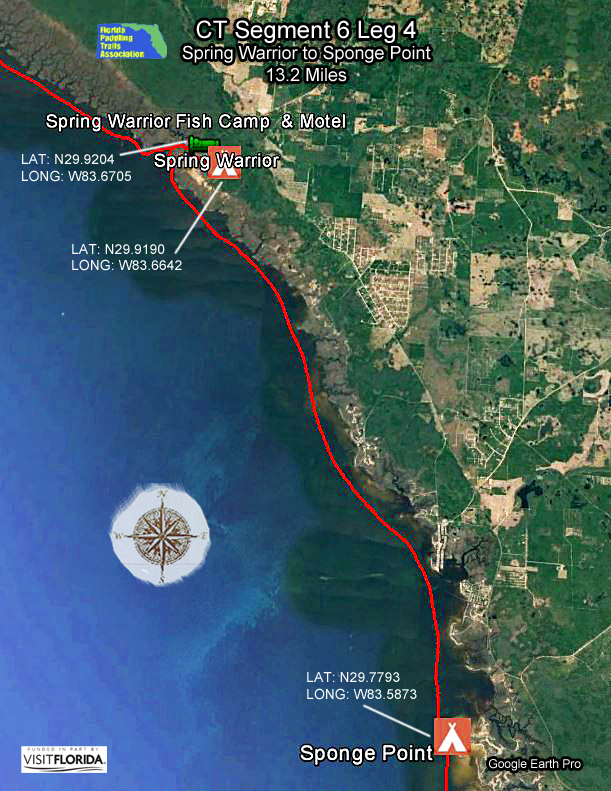 The journey starts at Navarre Beach, progresses through the Intercoastal waterway known as "the Narrows" near Fort Walton Beach and crosses Choctawhatchee Bay on the way to Destin. Might even call it your "DESTINation" for the day! After leaving the lights, shopping and fine dining of Destin behind you, several state parks and some of the world's only coastal dune lakes await. Grayton Beach State Park, located smack in the middle of new urbanist communities of Henderson Beach, Watercolor and Seaside is the terminus of this segment. *Locals call it "singing sands" as the quartz crystals in the sand squeak as you walk. Two rivers in this segment also delight paddlers: the Yellow and Shoal. Located in the western Panhandle near Crestview, the Yellow River is unique in that it drains the state's highest elevation. As a result, the current is faster and there are numerous high banks. The Shoal River, on the other hand, usually has a slower current and is easier to paddle upstream if desired. 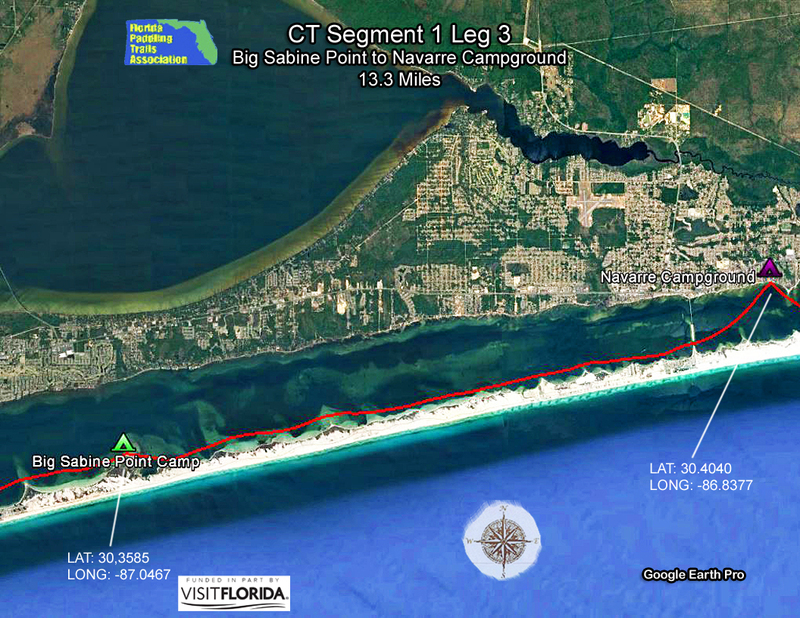 The second half of the coastal portion of this segment covers open Gulf waters where paddlers will first encounter the Emerald Coast's famous white sand beaches, along with increased wind and wave action. Crossing Destin Harbor you may experience significant tides and boat traffic. Be sure to bring a mask and snorkel if paddling either Holmes Creek or Econfina Creek. 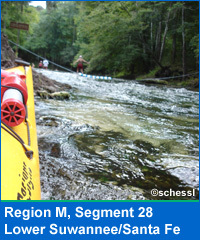 Both are remote streams that feature crystalline springs. Also, the upper portion of Econfina Creek might be the most challenging river paddle in Florida due to its rushing water, hairpin turns and steep banks. The middle and lower portions of the river are slower moving and okay for beginners. 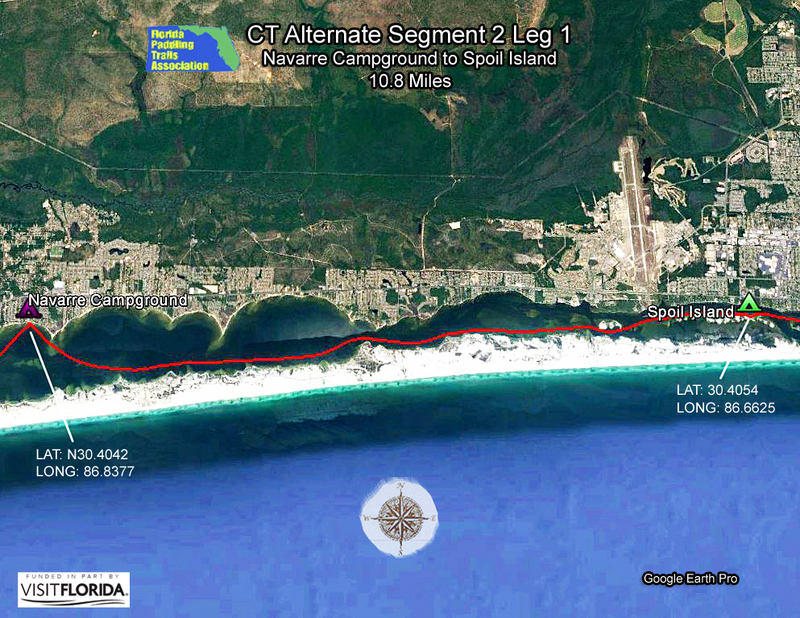 The coastal part of this segment starts at Grayton Beach State Park. It's one of the few places in the world where coastal dune lakes meet saltwater and a sliver of sand is all the separates the freshwater of Western Lake from the Gulf of Mexico. After exploring Western Lake be sure to stop at the master-planned resort community of Seaside. It's picture perfect, in-fact so much as many of the scenes from the movie The Truman Show with Jim Carey were filmed here. Next stop is Panama City Beach (PCB), popular with vacationers and home to one of the largest Spring Break gatherings in the state. If you plan on staying at a motel be sure to get reservations in advance, as spring and summer are the busy seasons. Leaving the "big city" behind, you'll enter into a more remote environment where your new companions are dolphins and an occasional fishing boat or jet fighter from Tyndall Air Force Base. 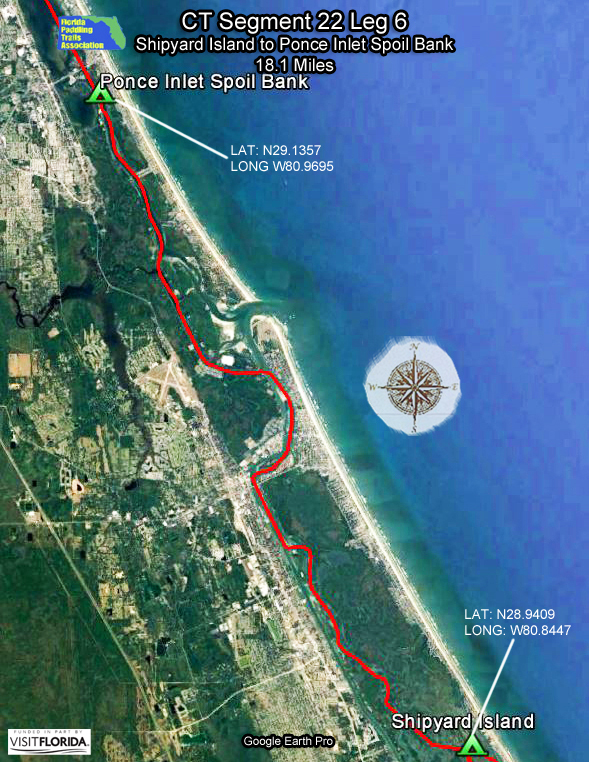 This stretch (25 miles) offers incredible views of coastal dunes shaped by years of storms. St. Joseph Peninsula State Park is a fitting end to this saltwater section, offering a true coastal wilderness experience. The preserve is accessible by foot or by boat, and circumnavigation paddlers can primitive camp in the preserve with advance reservations. 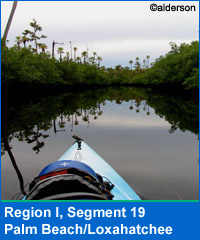 The upper part of Econfina Creek requires intermediate to advanced paddling skills. It may require an overnight camping stop to complete section. The gauge at Scott's Bridge at put-in should be between 2 and 4 feet for best results. The coastal stretch has long stretches without public camping locations and will require motel overnights. Distinguishing motels from condominiums from the water can be difficult, as most motels are not marked on the water side. B: The Forgotten Coast. 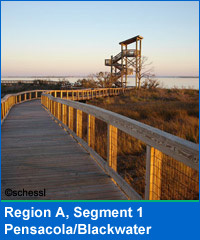 The coastal section features several undeveloped barrier islands and three dynamic bays, St. Joseph, Apalachicola and Ochlockonee. It also includes the Crooked River through Tate's Hell Swamp State Forest and a chance to catch a glimpse of a Florida Black Bear. Wild interior rivers include the Chipola, Apalachicola, Ochlockonee, Sopchoppy, Wakulla, St. Marks, Wacissa and Aucilla. Along the coast, vast tracts of unspoiled public lands and islands are featured in this segment, from the high dunes of St. Joseph Peninsula State Park to the wild palm-lined shores of St. Vincent Island to the old-growth coastal forests of Cape St. George State Reserve. Apalachicola Bay is a dominant natural feature, providing incredibly productive fishing and shellfish harvests. Not only will paddlers see numerous oyster boats and their crews scouring the waters of Apalachicola Bay, but if they time their trip right, succulent oysters await at the annual Apalachicola Seafood Festival (early November). Just inland from the bay, paddlers can enjoy 10 mapped paddling trails through small bays and down remote cypress and tupelo lined creeks. These scenic streams bear intriguing names such as Whiskey George and Thank You Ma'am. They are part of the state-owned Apalachicola River Wildlife and Environmental Area. Some overnight trips are possible. A major tributary of the Apalachicola River is the Chipola River. Several springs feed into the river and some caves can be found along the steeper banks. A small shoals known as "Look and Tremble" can give paddlers a thrill. Contact: Contact our Region B Director or Trailkeeper for more information by clicking here. Do not disturb bats inside caves along Chipola River. Many are endangered. Paddling trails abound in this segment. River trails range from the larger Ochlockonee, to the tannin-colored Sopchoppy, to shorter spring fed streams such as the Wakulla and Wacissa. 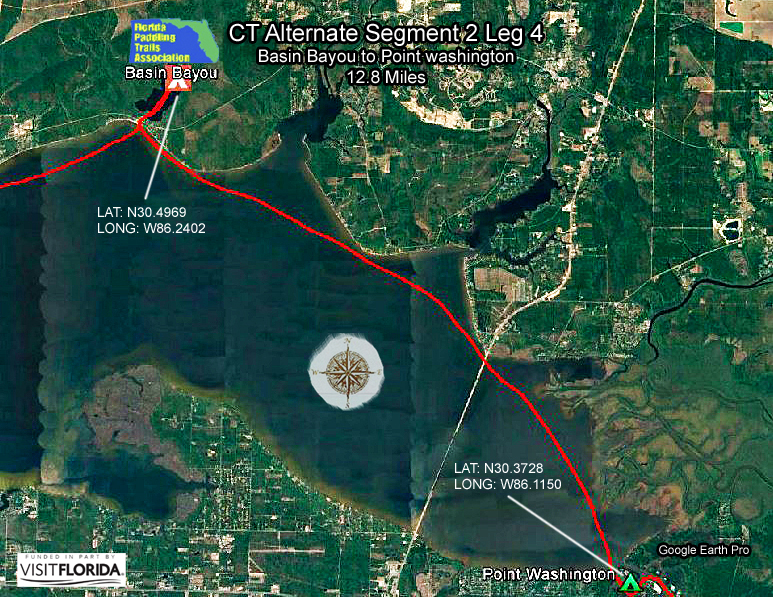 Paddlers can also explore two different connected lake systems near Tallahassee: the Lake Bradford Chain of Lakes and the Lafayette Passage Trail. Following the circumnavigational trail along the coast, paddlers can observe major geologic changes that have taken place over millennia. St. George and Dog islands mark the end of a chain of barrier islands that have been formed by sediments deposited by the Apalachicola and Ochlockonee rivers while islands to the east are sections of land isolated by rising sea levels. Paddling east on the Crooked River through Tate's Hell State Forest you'll have a good chance of spotting a Florida black bear. 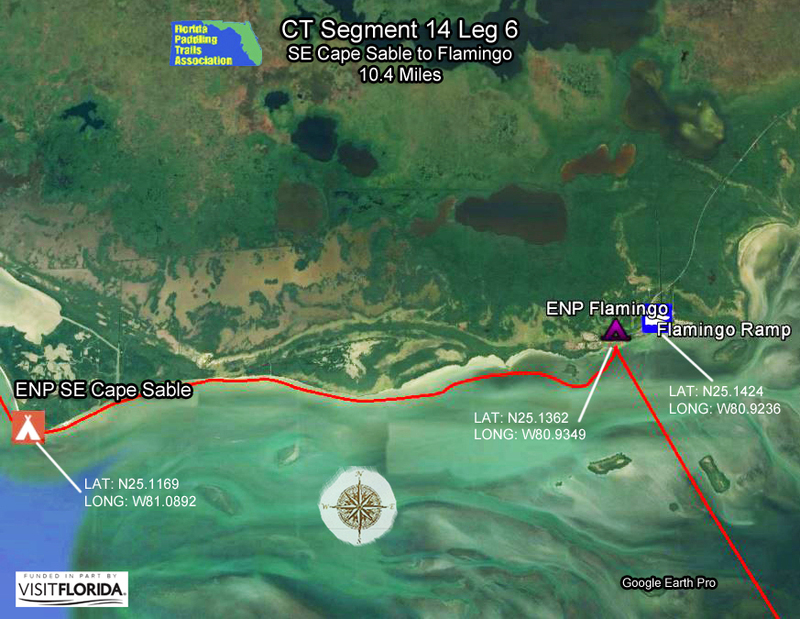 The second half of the segment along the coast spans the entire length of the St. Marks National Wildlife Refuge. Here, you'll see unspoiled marshy vistas, tree islands, and an historic lighthouse. Hunting is popular in the Crooked River section from November to February. Wear bright colors when paddling near hunting areas. C: The Nature Coast. 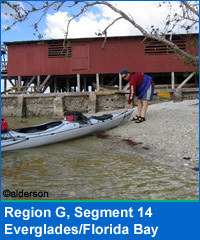 The most remote coastal region north of the Everglades, paddlers will enjoy unmarred vistas of salt marsh, tree islands and winding tidal creeks. Small coastal trail towns with rich histories add a cultural flavor. In winter, manatees abound in King's Bay. River trails in the region include the Steinhatchee, Withlacoochee South, Homosassa, Chassahowitzka, Weeki Wachi and Pithlachascotee. 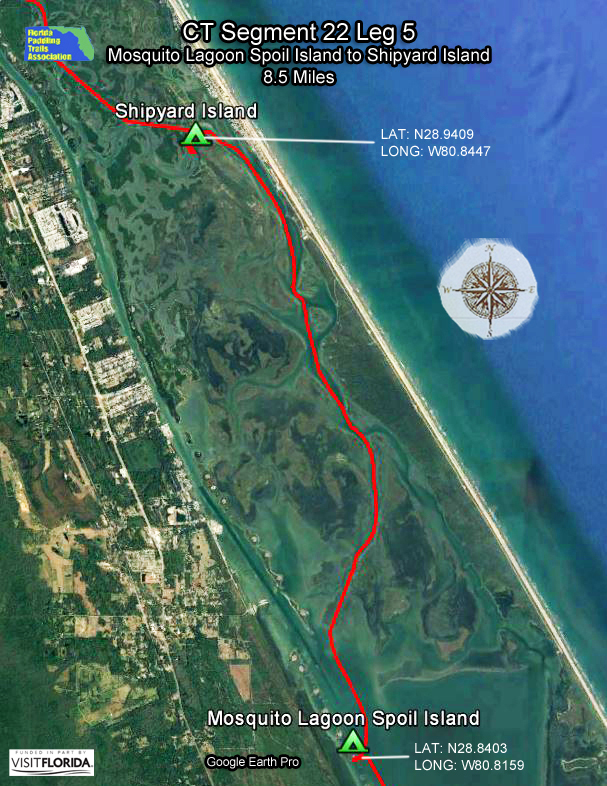 With the exception of the Ten Thousand Islands / Everglades segment, this is the remotest part of the circumnavigational trail, and certainly the longest, featuring 153.5 miles of unspoiled shoreline, marsh and sea islands. 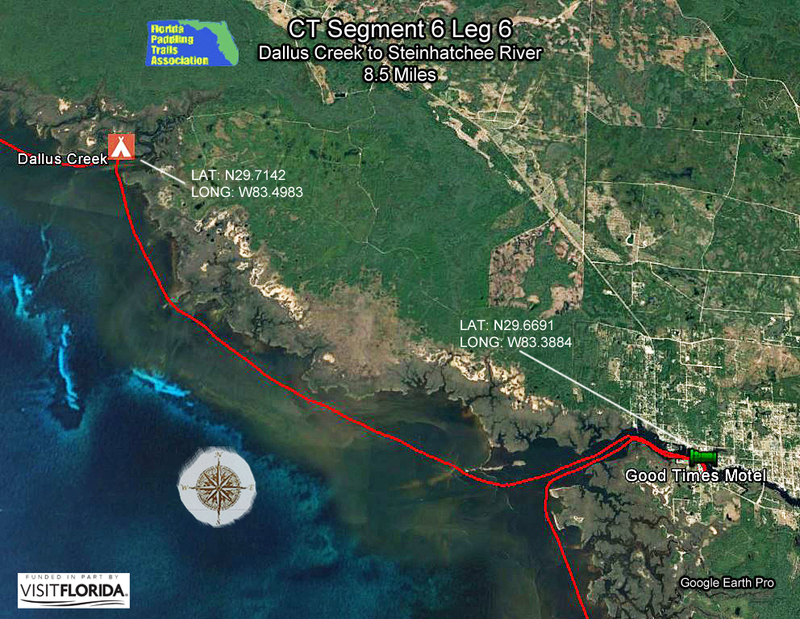 The first 95-mile stretch of the trail, including six primitive campsites, is managed by the Florida Fish and Wildlife Conservation Commission (FWC) as part of the Big Bend Saltwater Paddling Trail. Free permits must be obtained before using any of the campsites and you must paddle from top to bottom. 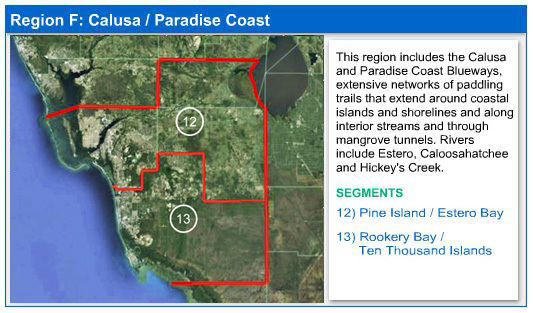 For more information about FWC permits and how to purchase the trail guide, MyFWC site. Near the Suwannee River, you'll pass through lands managed by the Lower Suwannee National Wildlife Refuge and the Cedar Keys National Wildlife Refuge. Camping is not allowed in either refuge. 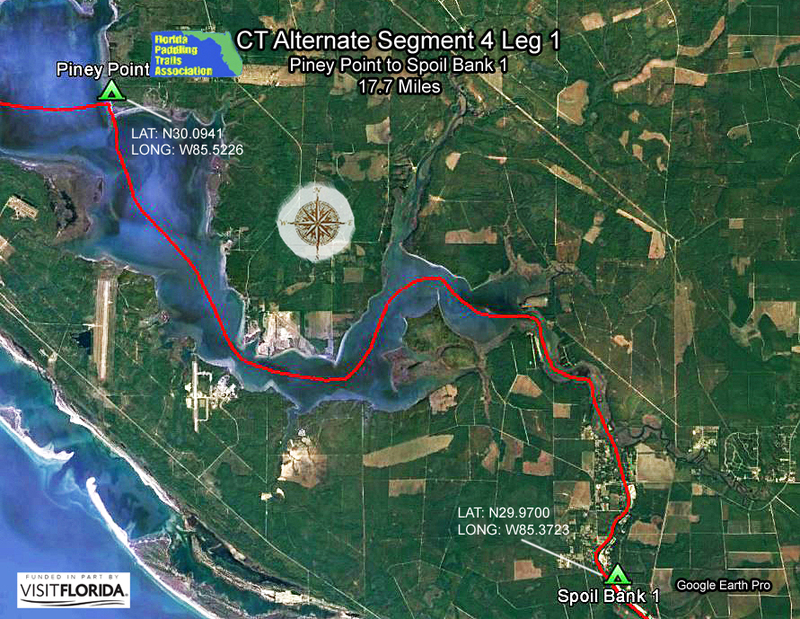 The coastal part of the segment ends at the Cross Florida Greenway Spoil Island near Yankeetown. Be sure to stop in Yankeetown for that well deserved shower and piping hot meal! Two rivers also lure paddlers: The Econfina and Steinhatchee. Both are swamp-fed and tannin colored. The Econfina is more of a wilderness river with abundant wildlife and some snags to negotiate. The Steinhatchee is passable below Highway 98 where it emerges from underground and includes a shoals area known as Steinhatchee Falls. The shores become more developed with fish camps and seafood restaurants near the town of Steinhatchee. Since online maps may not be available for the Econfina and Steinhatchee rivers, it is recommended that paddlers obtain a copy of "A Canoeing & Kayaking Guide to Florida." Contact: Contact our Region C Director or Trailkeeper for more information by clicking here. If manatees, pelicans, wading birds, gators, dolphins and bobcats excite you, this segment may be perfect for your next extended paddling trip. Starting with unmarred beaches, miles of sawgrass and small fishing communities in the north and ending near the metropolitan Tampa Bay area, you'll get the opportunity to experience some of the best coastal paddling in Florida. 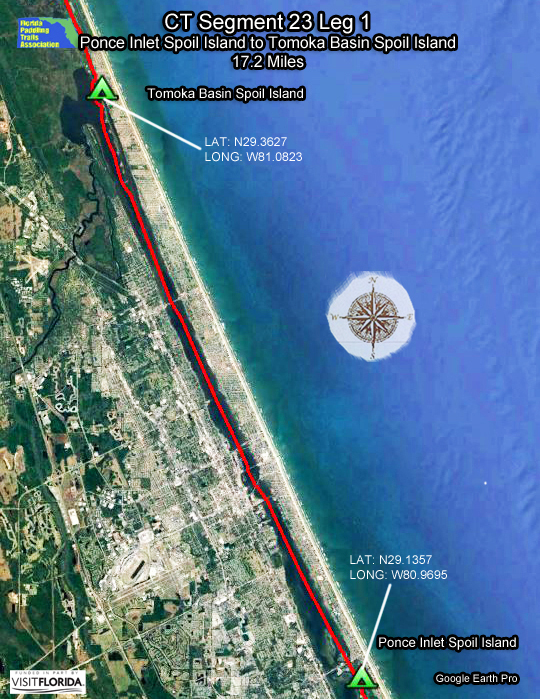 To begin the coastal part of this segment, launch at the mouth of the Withlacoochee River or from the Cross Florida Greenway. Paddle toward the Crystal River coal and nuclear power plants. Pods of manatee can be seen on the north side of the jetty where warm water is released from the power plants. After crossing the jetty, aim for the mouth of Crystal River. 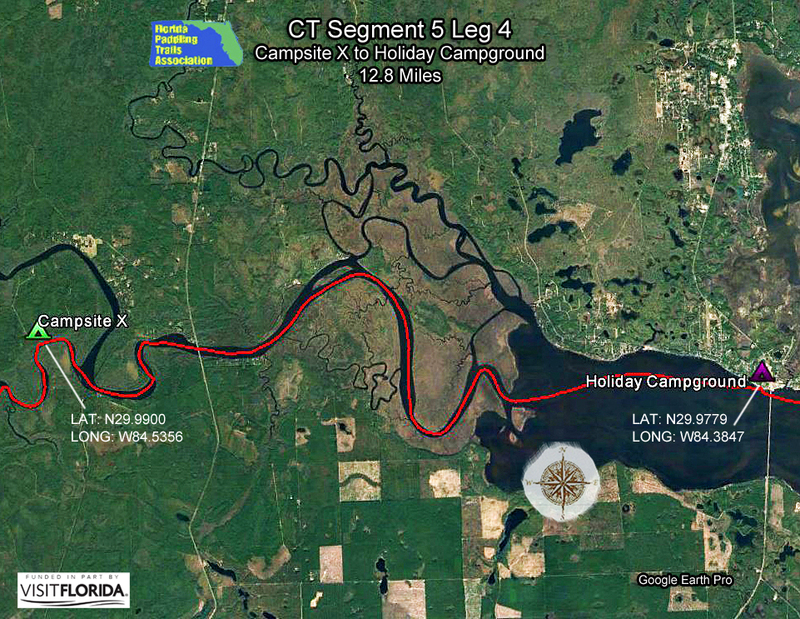 Between Crystal River and the Chassahowitzka River Campground you'll need a GPS. There are numerous twisty paths in the salt marsh so it's important to watch the GPS carefully. From Chasahowitzka the next stop is the Weeki Wachee River, some 21 miles away. 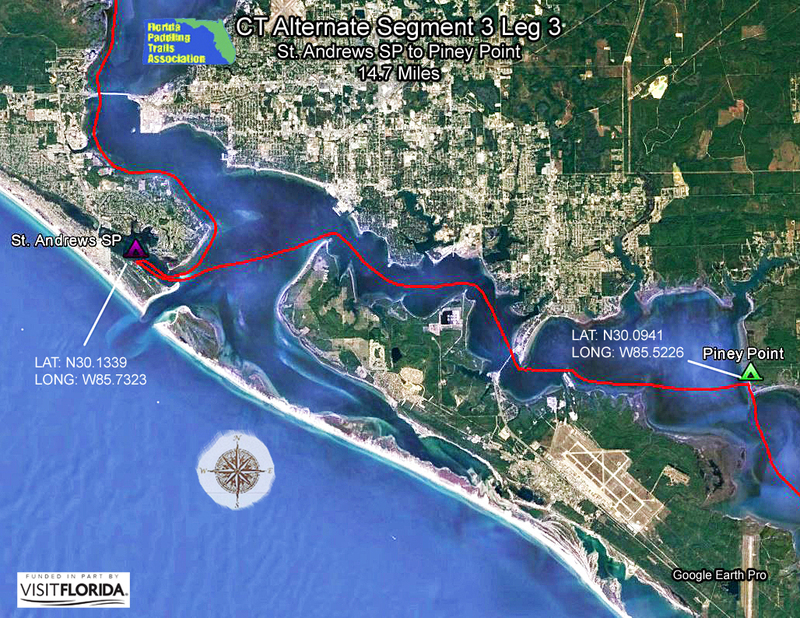 It's then back into the saltwater past Hudson and Port Richey to your destination at Anclote Key. For day trips, the springfed Crystal River, Chassahowitzka, Homosassa and Weeki Wachee rivers are ideal, although weekdays are recommended if you want more peace and quiet. The Pithlachascotee near New Port Richey is also an ideal river for day trips, representing the best of more "urbanized" water trails. For an extended river trip, try the Withlacoochee River South. Once the refuge for Seminole Indians during the Second Seminole War, the river emerges from the Green Swamp and flows through scenic sandhills before entering a swampy terrain of cypress, gum and maple. 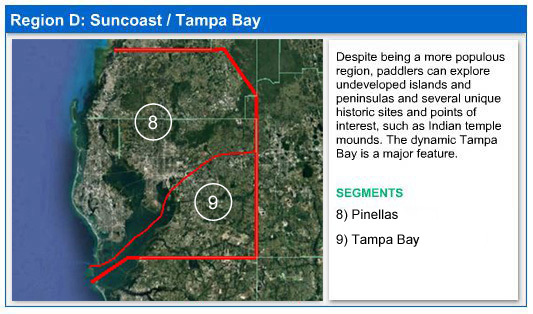 D: The Suncoast / Tampa Bay. Despite being a more populous region, paddlers can explore undeveloped islands and peninsulas and several unique historic sites and points of interest, such as Indian temple mounds. The dynamic Tampa Bay is a major feature. Rivers include the Hillsborough, Alafia, Little Manatee and Upper Manatee. This segment marks the beginning of a long stretch of urbanized coastline as you head south, but don't let that discourage you. You'll still be able to enjoy natural surroundings at several parks including three premier Florida state parks: Anclote Key, Honeymoon Island and Caladesi Island. 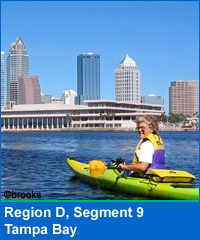 The extensive Pinellas County Blueways provides additional paddling opportunities and trip options along the coast. 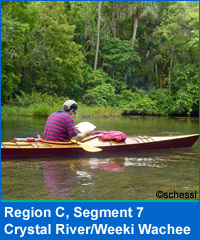 Plus, on the interior, the Hillsborough River offers a leafy canopy long enjoyed by paddlers. 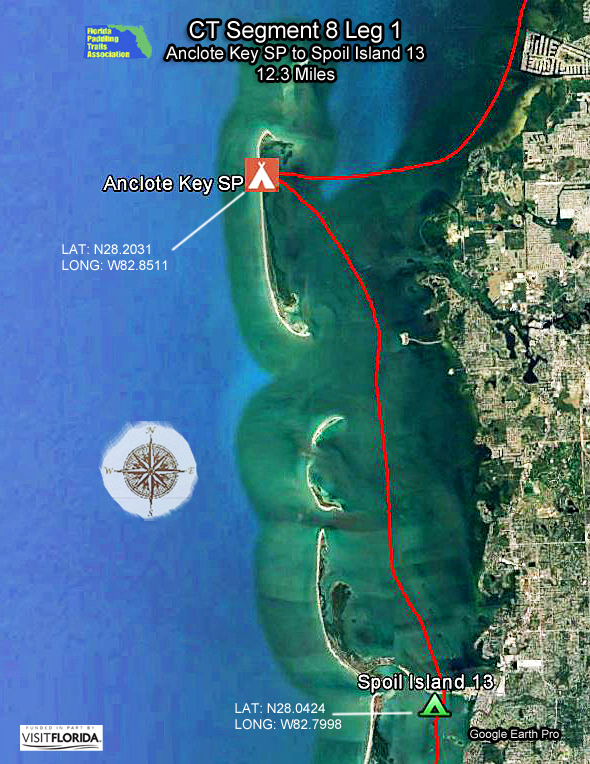 The coastal portion of segment 8 starts at Anclote Key, a 3-mile long uninhabited barrier island near Tarpon Springs. Water around here is known to get rough during bad weather, so plan accordingly. After leaving Anclote Key, make your way down a chain of spoil islands to the Dunedin Causeway. Honeymoon Island State Park rests at the end of the causeway and a little further south is Caladesi Island, best known for its soft white sand beaches. South of Caladesi Island are the metropolitan cities of Clearwater and St. Petersburg. Paddling this stretch affords you with many opportunities to pull over and rest, grab a bite to eat and even find a hotel for the night. For those preferring a tent to a hotel room, camping can be found on several spoil islands on the way to Fort De Soto Park. Contact: Contact our Region D Director or Trailkeeper for more information by clicking here. The 17 Runs Section of the Hillsborough River is meant to remain a wilderness stretch of the river. It has numerous snags and side channels and should be attempted by experienced paddlers only. Looking for variety of animal life, scenic beaches, fascinating attractions and historic sites? How about mangrove creeks and scenic rivers that offer a surprising slice of natural Florida? It's all here. You can explore paddling opportunities along Tampa Bay by utilizing the Hillsborough Blueways guide. The guide highlights trails for canoes and kayaks on the rivers, creeks, bays and estuaries throughout Hillsborough County. For freshwater rivers, the Alafia provides the paddler with an occasional shoals to get the heart pounding. There are also the wild Upper Manatee and Little Manatee rivers with their manatees, otters, alligators and other wildlife. 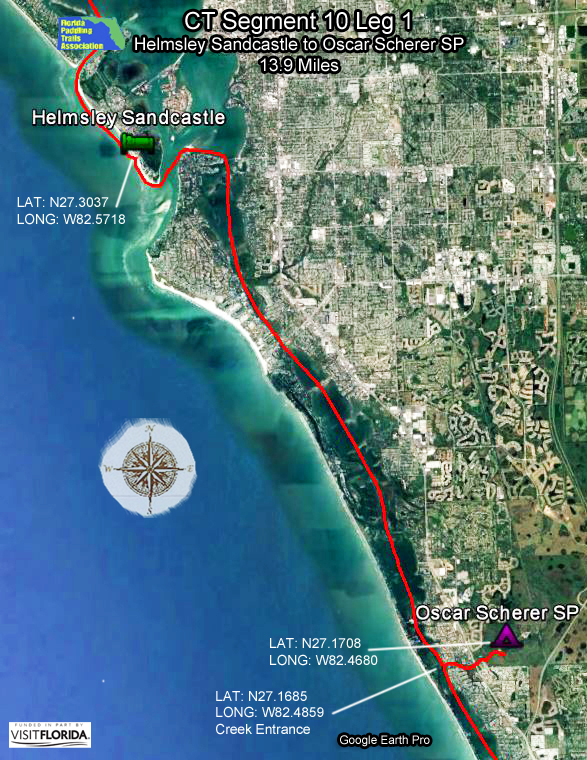 The circumnavigational trail part of this segment starts at Fort De Soto Park, crosses the mouth of Tampa Bay and continues south along the Manatee coastline before ending at Lido Beach. Crossing Tampa Bay is for experienced paddlers only in calm weather. Strong currents, large ships and waves are factors in the long open water passage. 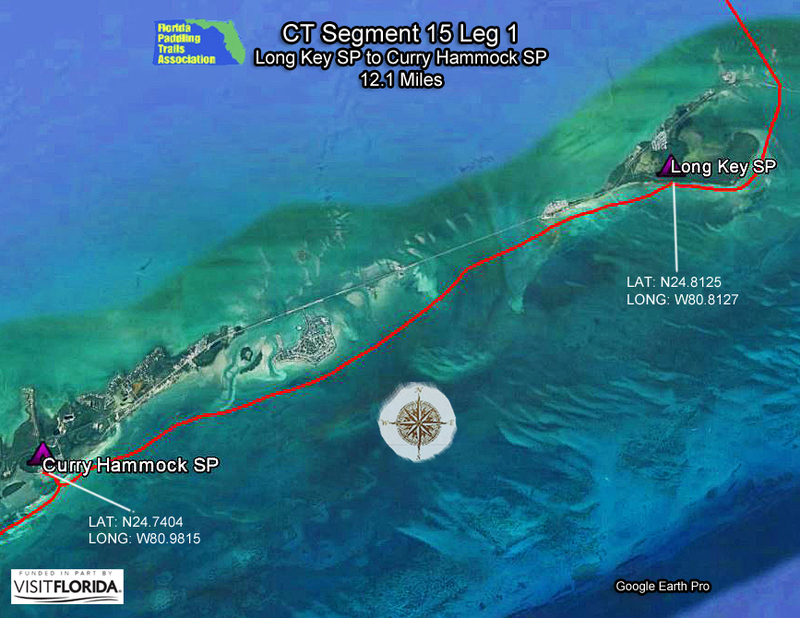 The shortest distance is Fort De Soto to Egmont Key (2 miles), paddle the length of Egmont (2 miles), Passage Key (2 miles) and then to Anna Maria Island (1 mile). In less than optimum weather, we recommend waiting it out or shuttling your boat to Anna Maria. After arriving at Anna Maria Island, you have two route options, either the Gulf side or Intercoastal Waterway through Anna Maria Sound and Sarasota Bay. Facilities can be found on both routes. 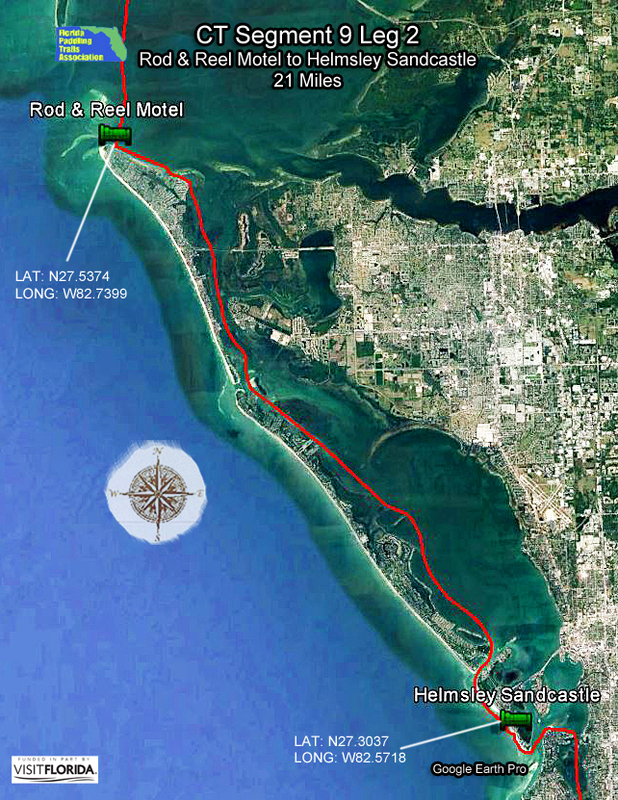 The final coastal stop on this segment is Lido Key, famous for its sun-kissed beaches and southwest Florida lifestyle. After the 15 mile paddle from Bradenton Beach be sure to visit St. Armands Circle for some well deserved upscale dining. Bring a clean shirt! E: Charlotte Harbor. Sarasota Bay and Charlotte Harbor, with their rich bird and marine life and numerous barrier islands, are highlights of this region. Interior trails include the wild Myakka River and fossil-rich Peace River. 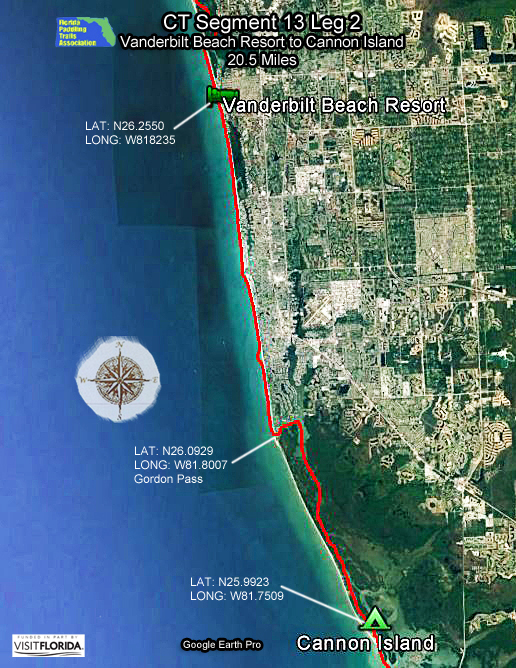 Along the coast, this segment provides paddlers with an opportunity to view a wide variety of animal and plant life, scenic beaches and local parks. On the journey through Sarasota Bay and numerous other smaller bays, be sure to look for bottlenose dolphins and manatee. 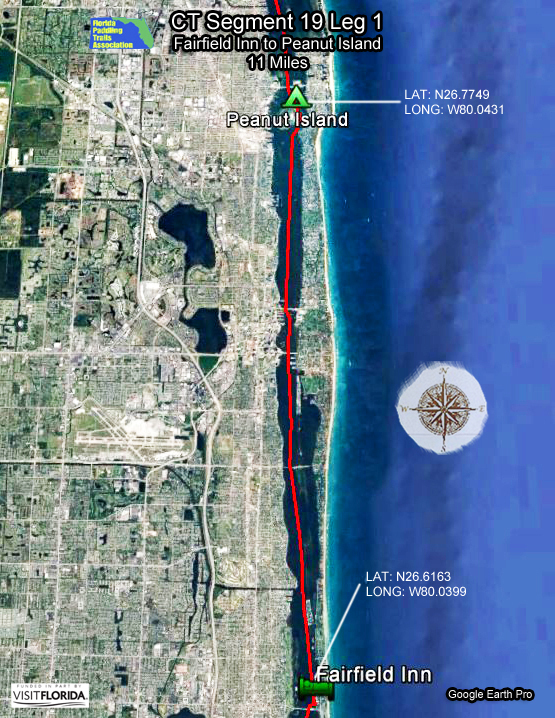 The circumnavigational trail portion of the segment begins at the canoe/kayak launch at South Lido Beach Park or at Lido Beach on the Gulf side, depending on winds, weather and personal preference. Eight miles to the south lay Turtle Beach Park, which has boat ramps, picnic shelters and camping sites. Contact: Contact our Region E Director or Trailkeeper for more information by clicking here. Give alligators their space along the Myakka River. Do not bring canine companions. 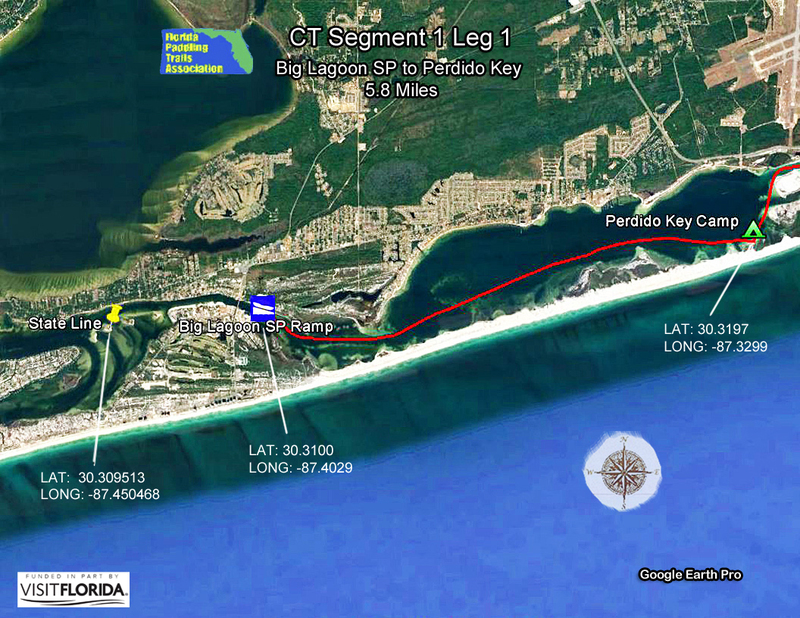 For the circumnavigational paddlers in this segment, developed and pristine barrier islands contrast each other and paddlers have the option of cruising the bay side or the Gulf side, depending on weather and individual preference. The wild Myakka River through Myakka River State Park has long thrilled paddlers, being one of only two federally designated wild and scenic rivers in Florida. The river is not for the squeamish as monstrous alligators exceeding ten feet in length are commonly seen. Roseate spoonbills and sandhill cranes are among the more than 250 species of birds found in the park. Traveling on the bay side, the first camping south of Stumps Pass State Park is Dog Island at nine miles. A permit is required to camp on Dog Island. 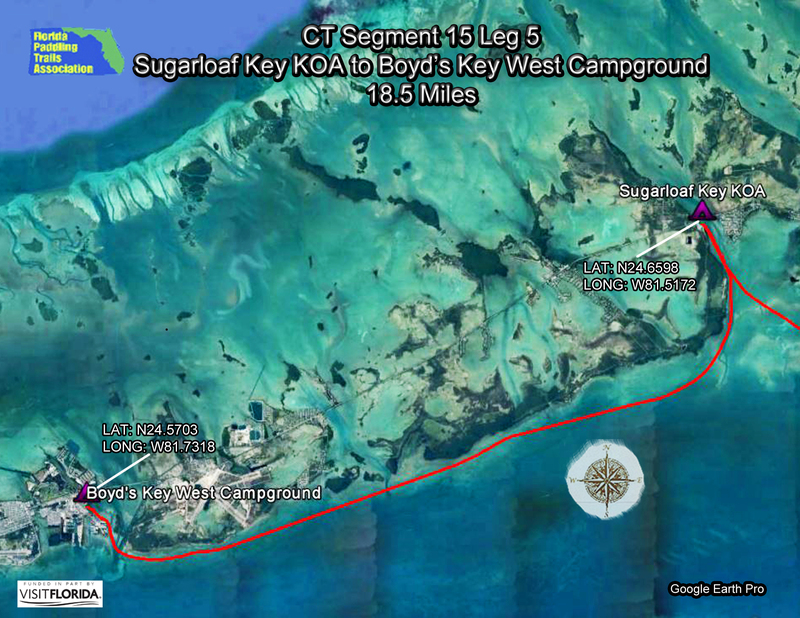 If time permits you can paddle on about 3 miles to Hoagens Key now a campsite of FPTA no permit required. Along the way, be sure to stop at Don Pedro Island to rest. Paddle behind the docks and beach in a small area near the walk over. A short walk from the landing area you will find drinking water, a place to take a cold shower and a toilet. The beach is a great place to go for a swim. 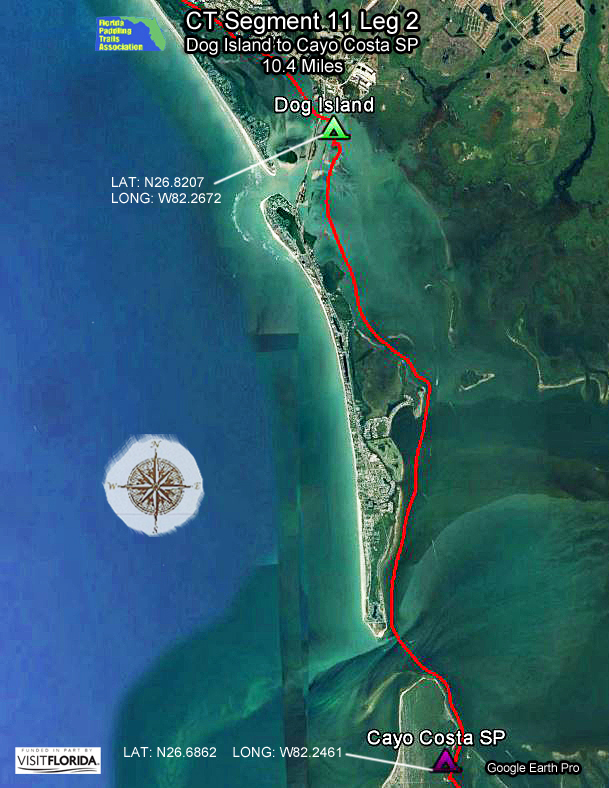 After staying the night at Dog Island, paddle through Gasparilla Sound along scenic Gasparilla Island. A must see is Gasparilla Island State Park, located just before Boca Grande Pass. Land along the bay side and stroll scenic beaches or visit the historic lighthouse before setting off for Cayo Costa. Boca Grande Pass can be challenging to cross and you should only do so under optimum weather conditions. 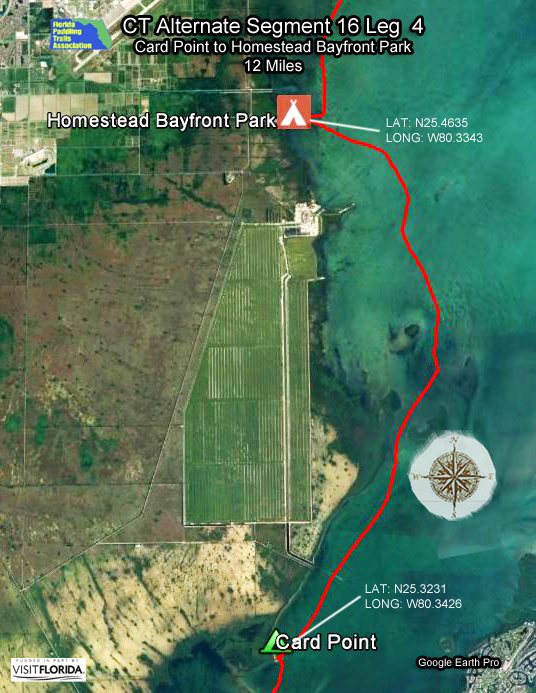 After making the mile crossing, follow the bay side of Cayo Costa Island for roughly another mile and you'll see the park's boat dock. A small inlet to the right of the dock leads to a kayak and canoe landing. For other trails, the Charlotte County Blueways highlights 57 trails for canoes and kayaks on the rivers, creeks, bays and estuaries throughout Charlotte County. For river paddling, you can't beat the Peace River where fossil hunting is a favorite pastime. Extreme caution should be taken in crossing Stump Pass and Boca Grande Pass. 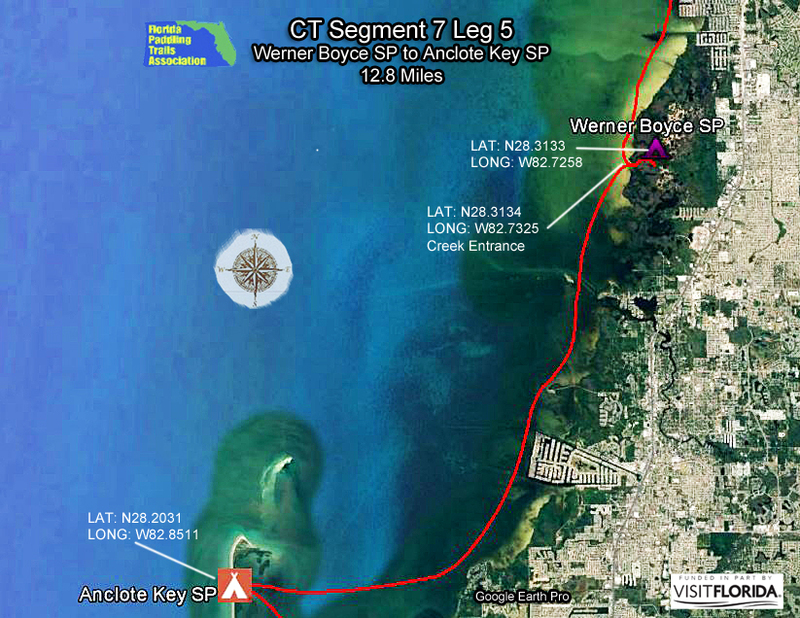 Due to currents, boat traffic and breakers on the Gulf side, these crossings should only be attempted by experienced paddlers in favorable weather conditions along the bay side. As with most South Florida segments, boat traffic can be heavy, especially on weekends. Boca Grande Pass can be packed with boats during the peak tarpon season, from April through June. The upper Peace River can be impassable during drought conditions. Call Canoe Outpost to check on conditions: 800-268-0083. F: Calusa / Paradise Coast. 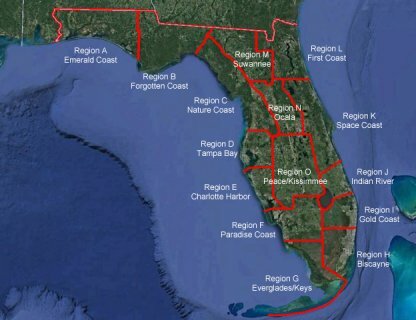 This region includes the Calusa and Paradise Coast Blueways, extensive networks of paddling trails that extend around coastal islands and shorelines and along interior streams and through mangrove tunnels. Pine Island Sound, Estero Bay and the remote 10,000 Islands are regional highlights. 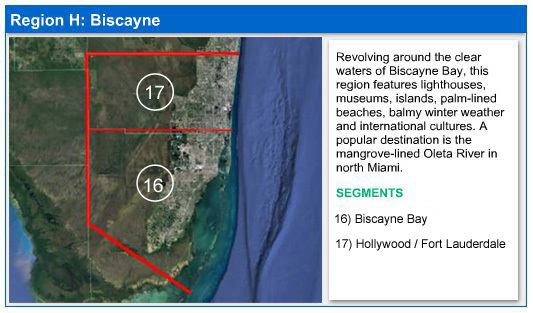 Rivers include the Estero, Caloosahatchee and Hickey's Creek. The 50-mile paddling trail along Fisheating Creek is also a huge attraction. This remote waterway that feeds into Lake Okeechobee is considered one of the best places for stargazing due to the absence of city lights. 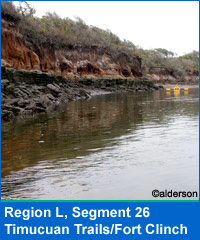 The dominant feature in this segment is The Great Calusa Blueway. 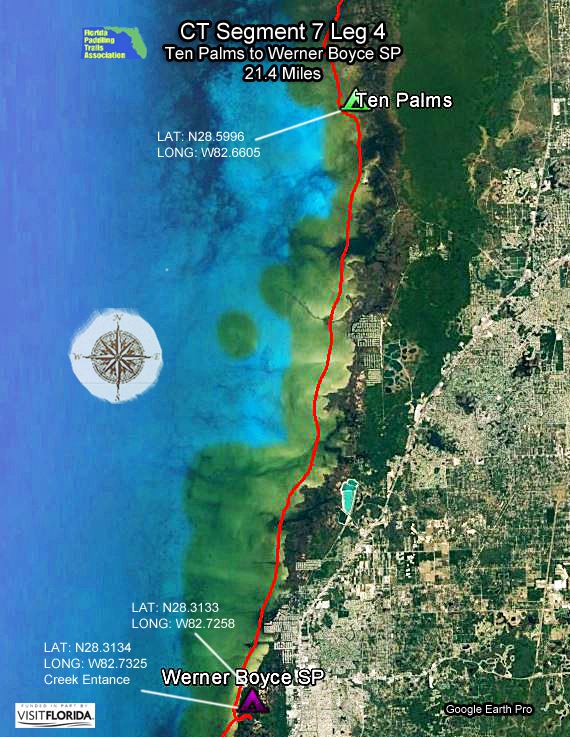 This 190-mile network of marked trails in Lee County extends from Pine Island Sound to up the Caloosahatchee River and down to Bonita Springs. The trail also coincides with the circumnavigational trail for several miles. 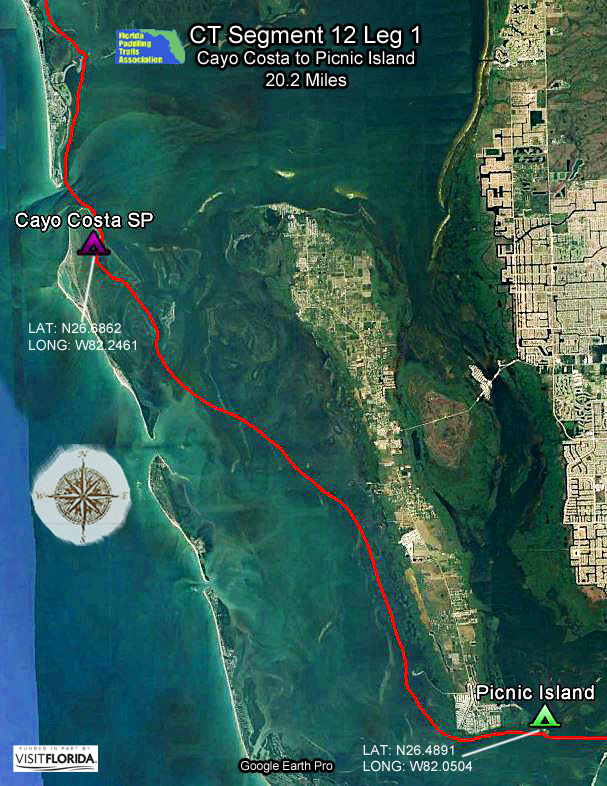 The northern edge of this segment, Cayo Costa State Park, is accessible only by boat. If you're starting from the mainland but want to spend time at Cayo Costa without paddling, a park service ferry can transport you and your belongings for about $25. While in the Cayo Costa neighborhood, be sure to stop at Cabbage Key, where there is a popular restaurant and lodge. 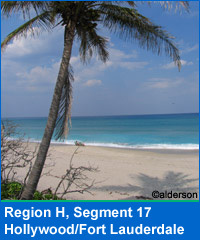 After enjoying a "cheeseburger in paradise", return to Pine Island to the northern- most town of Bokeelia. Here you'll find Jug Creek Cottages for an overnight stay. If traveling south on the circumnavigational trail, paddle east of Pine Island through Matlacha Pass Aquatic Preserve and south to the artsy fishing village of Matlacha. Beyond Matlacha lie Picnic Island and the Koreshan State Historic Site. 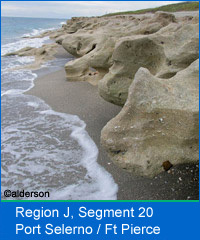 The romantic sounding Lovers Key / Carl E. Johnson State Park is an ideal place to end this segment. 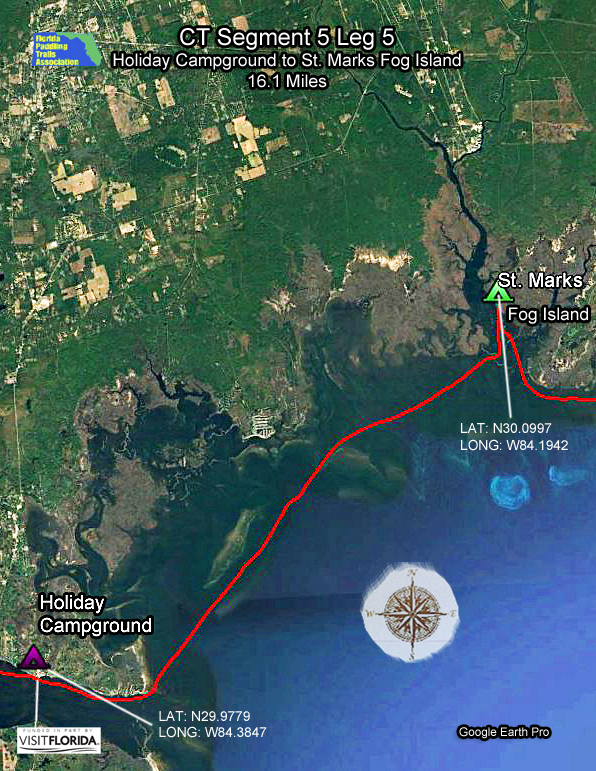 Once the possible hideout of the pirate Black Augustus, this cluster of barrier islands is the perfect place to hike, bike or land your kayak. Unfortunately for most lovers, camping is not allowed in the park. Two short river trails, Estero River and Hickey Creek, also attract paddlers who seek wild beauty. At the end of the Estero River is Mound Key, once a major village site of the Calusa Indians and now public property. The summit affords a panoramic view of the area. The 50-mile paddling trail along Fisheating Creek is also a huge attraction. This remote waterway that feeds into Lake Okeechobee is considered one of the best places for stargazing due to the absence of city lights. Contact: Contact our Region F Director or Trailkeeper for more information by clicking here. 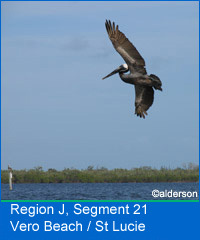 Welcome to Florida's Ten Thousand Islands and Rookery Bay. It's a watery maze of mangrove keys where Calusa Indians once dug canals and Seminoles and outlaws sought refuge. Men once eked out a living here by hunting alligators and making moonshine. It's the perfect place to escape from it all. 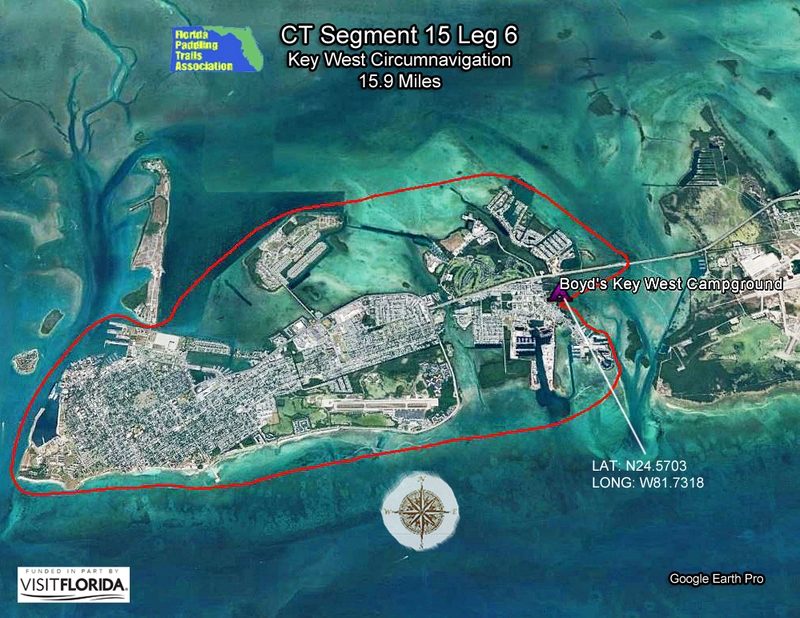 The romantic sounding Lovers Key State Park is an ideal place to begin this segment. You can paddle inside or outside the islands, depending on weather and preference. First stop is Wiggins Pass and Barefoot Beach. From here, hug the Gulf shoreline heading south to Key Island, just past Naples. Marco Island has the last supermarket on this journey, so stock up for the long haul. 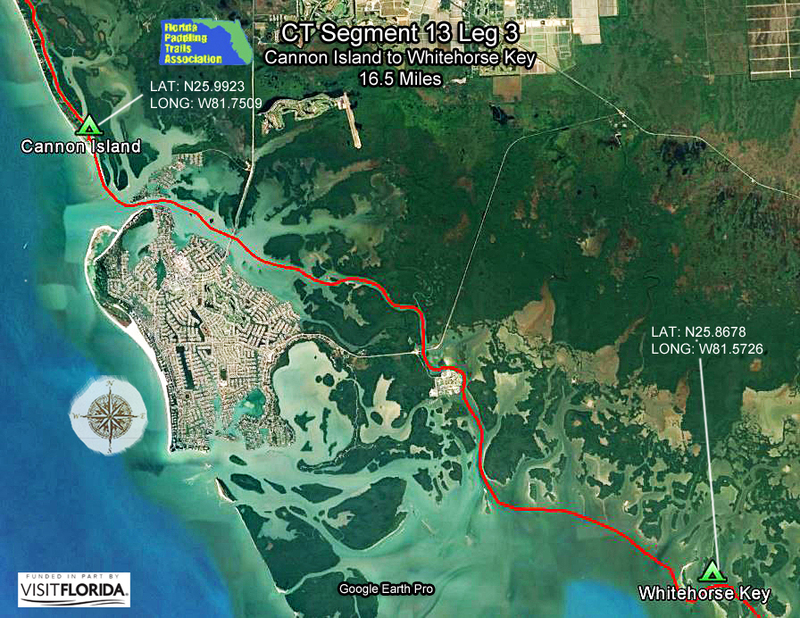 Next comes Cape Romano and Whitehorse Key, in the heart of the Ten Thousand Islands. Paddling the outside route makes for easier navigation. 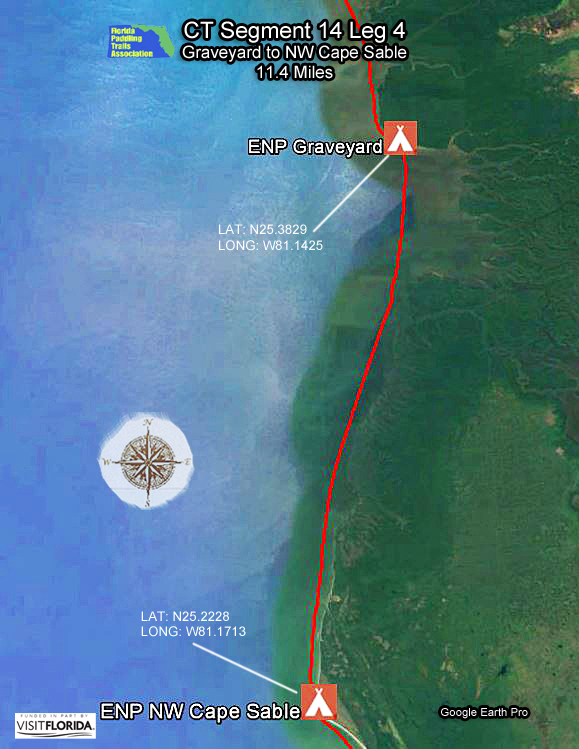 After Whitehorse Key, you will soon enter Everglades National Park. 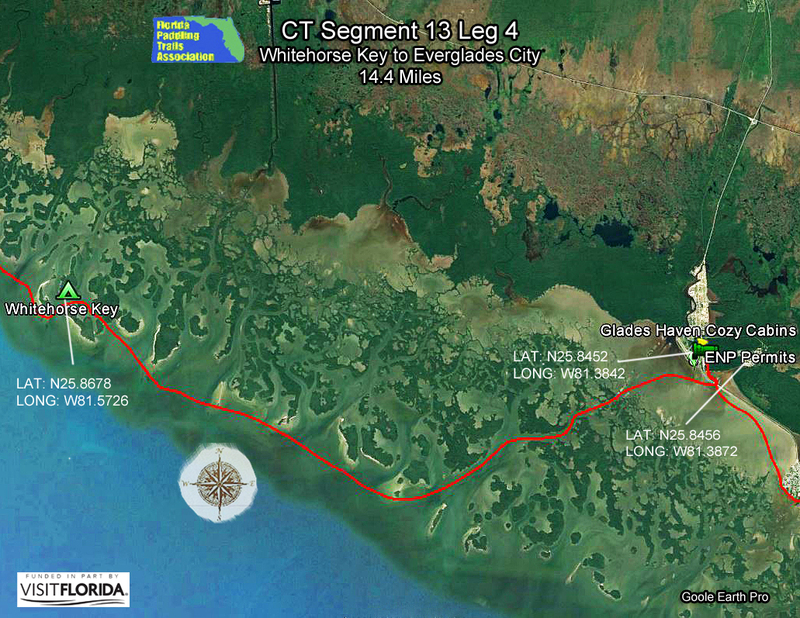 From Whitehorse, it's 14 miles of islands, sawgrass, mangroves to Everglades City. 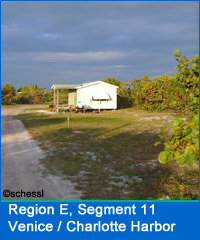 Camping within the park requires a permit that you must get in person from the visitor's center in Everglades City. 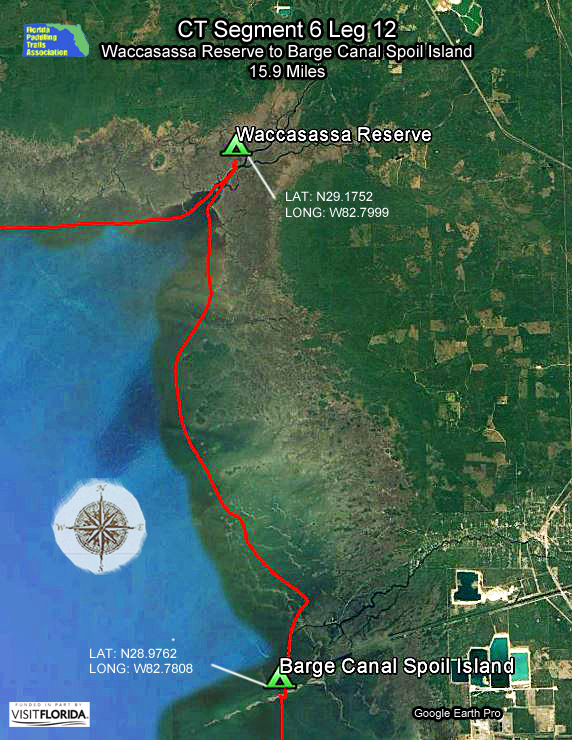 Another popular paddling trail in this segment is the Blackwater/Royal Palm Hammock Trail. 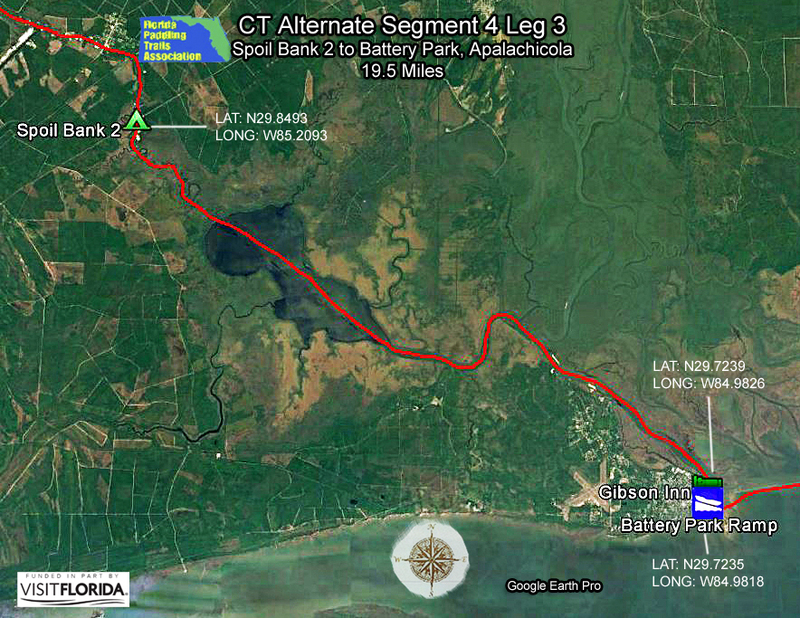 The remote trail follows tidally influenced creeks and shallow bays in Collier Seminole State Park. It is marked until it reaches a designated wilderness area, so good maps and a gps unit are necessary. Along the Blackwater/Royal Palm Hammock Trail, Palm Bay, Blackwater Bay, and Mud Bay are all potentially shallow depending on tide. Mud Bay may be impassable at low tide. G: The Everglades / Florida Keys. For a true wilderness experience, paddlers can choose either the Wilderness Waterway or a coastal route through Everglades National Park for several days of uninterrupted paddling. Then it is on to the Florida Keys and its crystalline waters and fun-loving maritime culture. 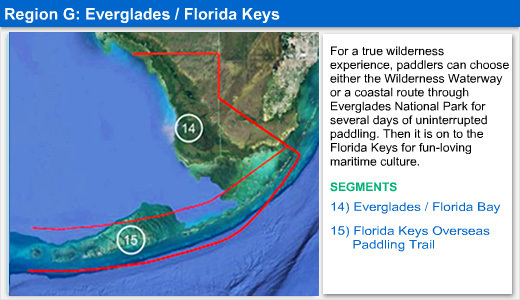 Everglades National Park and Florida Bay are two of Florida's natural treasures. In this segment, you'll see subtropical and tropical plants, marine and estuarine creatures and the only place in the world where alligators and crocodiles co-exist. 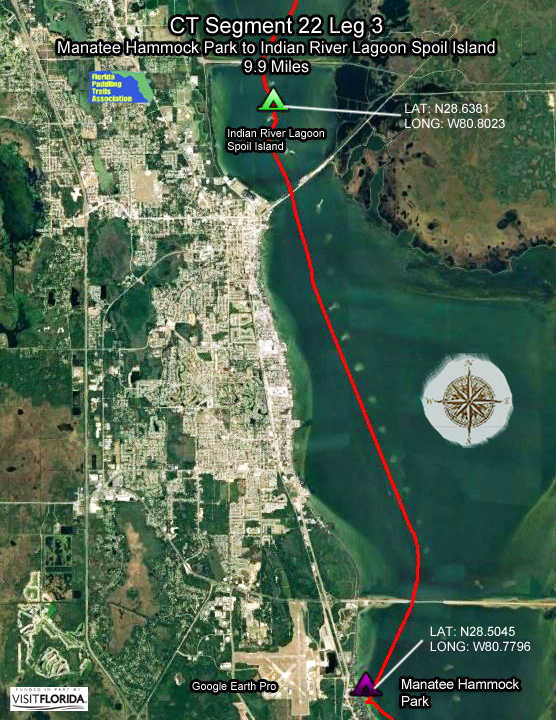 From Everglades City, you have a choice of taking the Wilderness Waterway to Flamingo, or the Gulf route. The Gulf route is shorter and generally has fewer bugs, but weather may be a deciding factor. 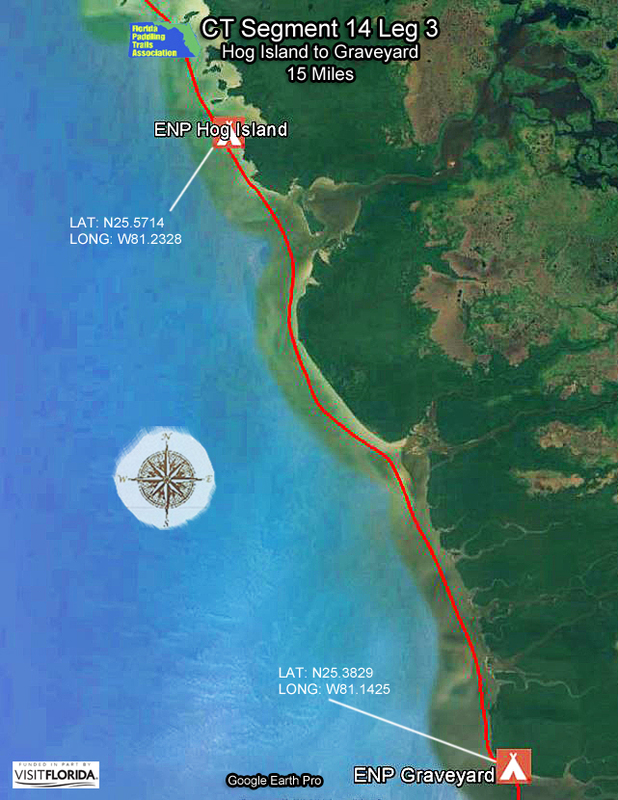 Campsites range from chickees that have been built on pilings in rivers and bays, ground sites that have been cleared within the mangrove forests, and beach sites. 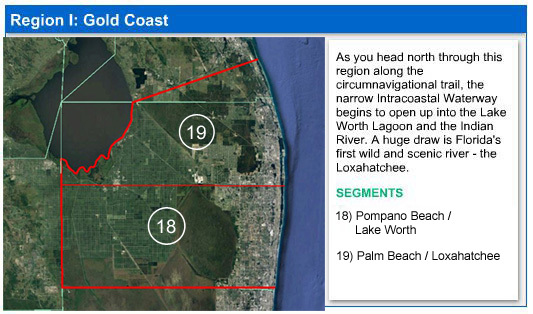 This segments starts at Everglades City. 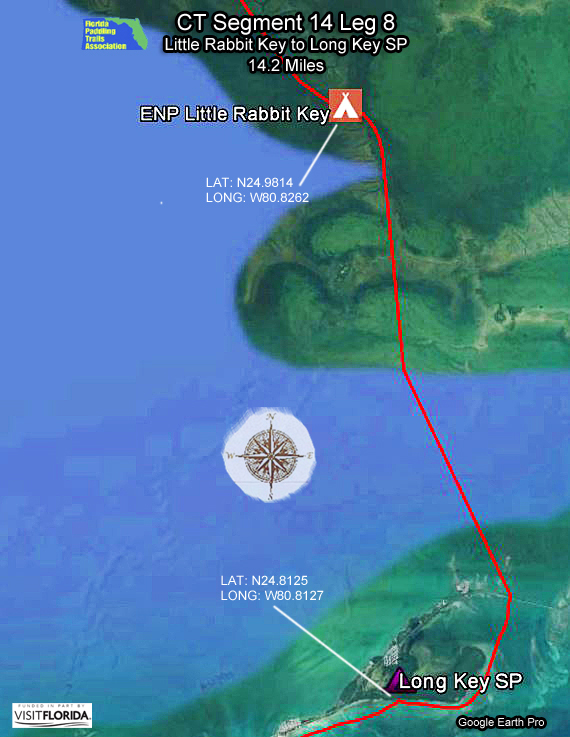 After launching, use the outgoing tide and head for Rabbit Key. 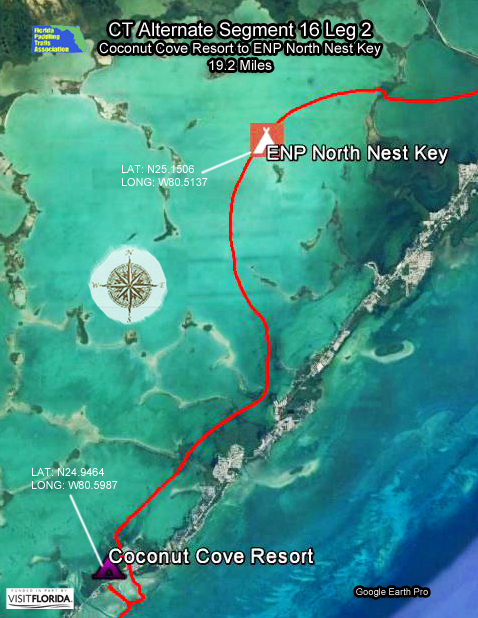 Next stops are Pavilion and Mormon Keys on the way to the campsite at Turkey Key. Water is very shallow so time your trip to arrive at high tide. 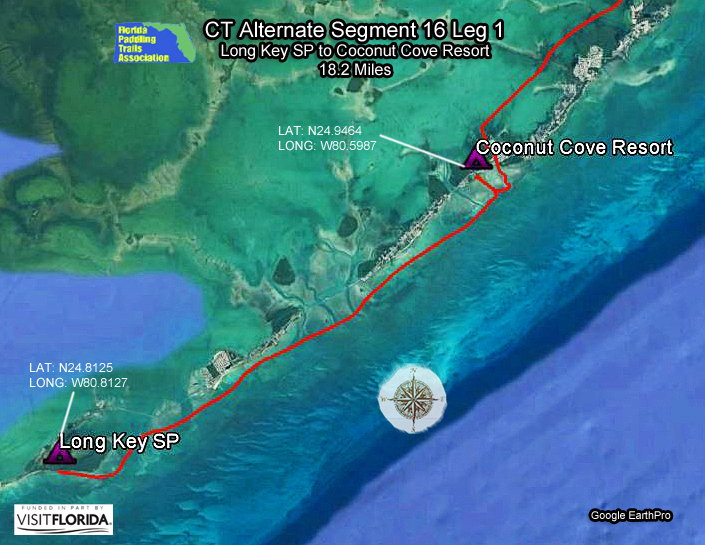 After Turkey Key, paddle Graveyard Creek to Cape Sable and on to Flamingo. Rest up at the visitor center before proceeding to Islamorada in the Florida Keys. Contact: Contact our Region G Director or Trailkeeper for more information by clicking here. 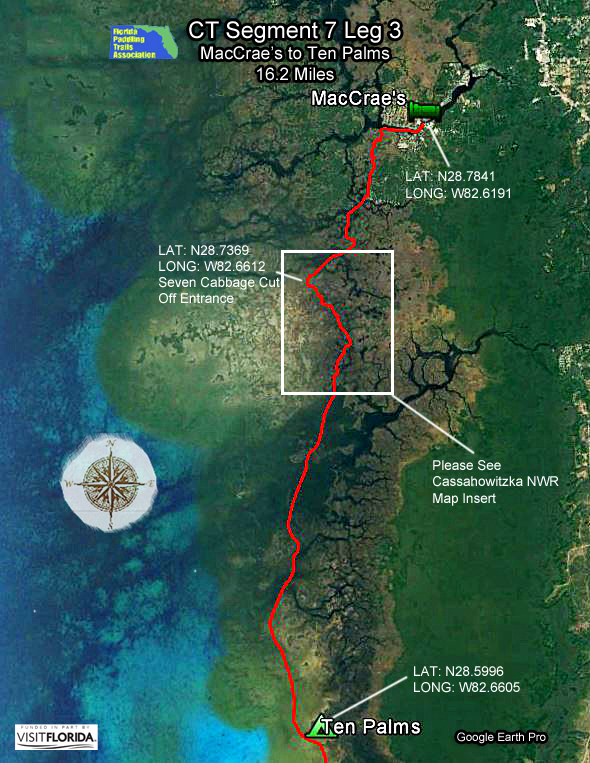 This is the longest stretch along the circumnavigation trail without fresh water. Plan on a minimum of a gallon of water per day, per person for 7 - 8 days. Campsites are limited and permits required. Permits are available in person at the visitor centers at Everglades City and Flamingo. 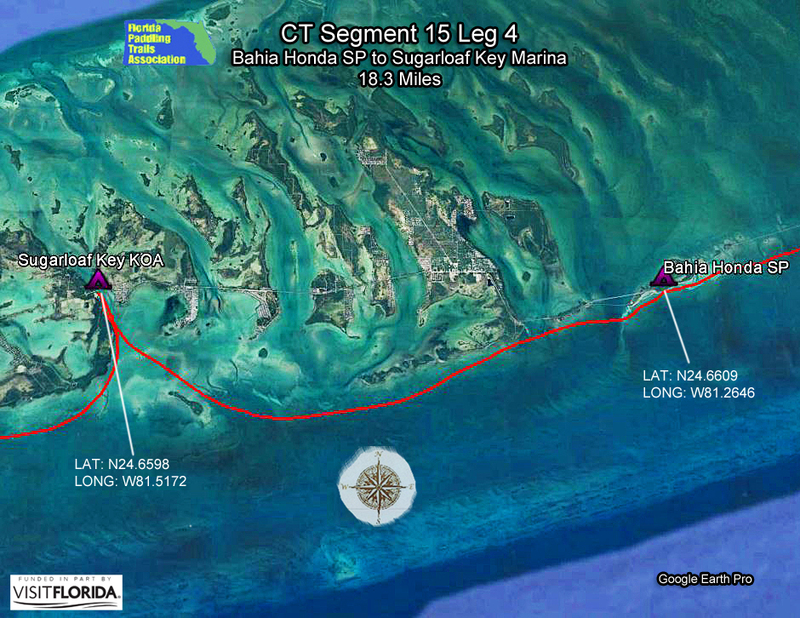 The Florida Keys Overseas Paddling Trail is a great place to spend your next vacation. Paddlers enjoy tropical splendor and a rich diversity of marine life, ranging from manatees and sea turtles to lobsters, fish and stingrays. When you need to take a break from paddling, civilization in the form of great restaurants, lodging and entertainment are within easy reach of the water. You begin this section at Pennekamp's canoe launch along Largo Sound. After leaving the park, head south toward Tavernier. Camping is not allowed so try several local hotels. 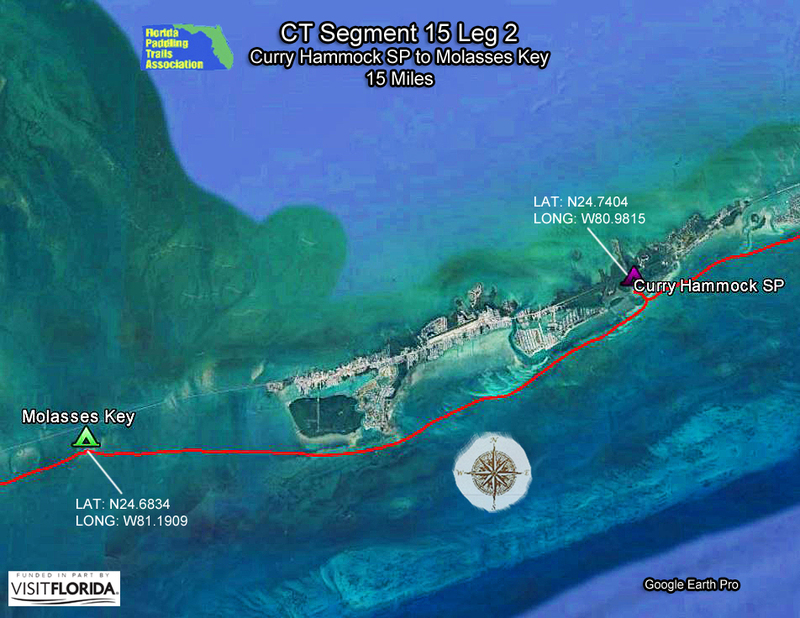 From Tavernier it is a straight shot along the 4 main islands that make up Islamorada: Plantation Key, Windley Key and Upper and Lower Matecumbe Keys. Incidentally, Islamorada is commonly known as the fishing capital of the world. 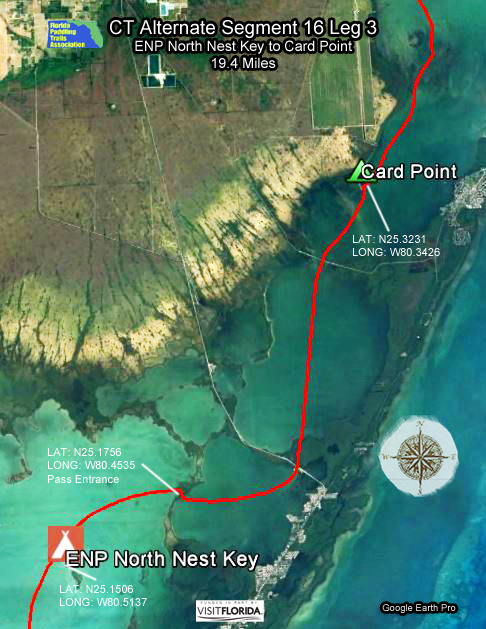 Forty-three miles of paddling later, you'll arrive in the Middle Keys of which Marathon is the largest community. 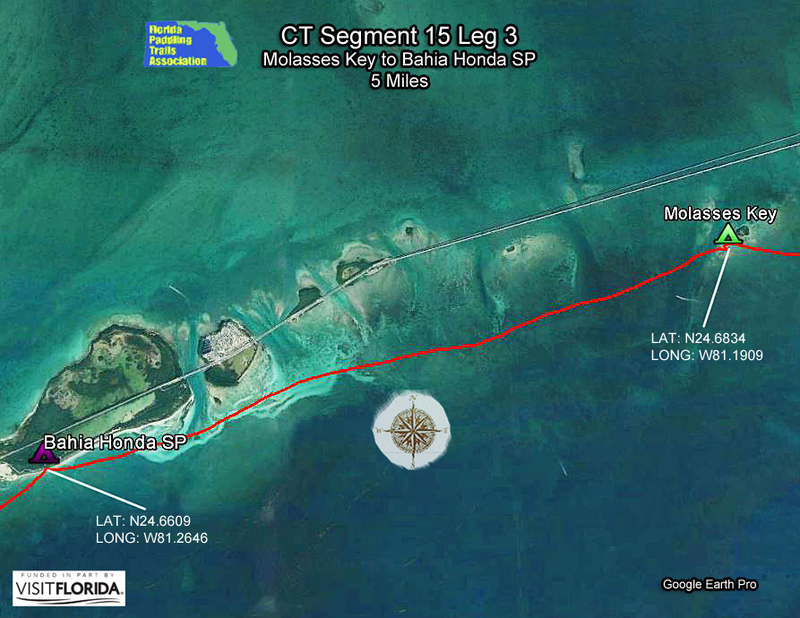 Camping is allowed on the smaller of the Molasses Keys in the middle of the Seven Mile Bridge crossing. Enjoy the view of the famous Seven Mile Bridge, a major architectural and engineering achievement. Next stop, Bahia Honda State Park. It's incredibly popular with tourists so reserve your campsite early. South of Bahia Honda lies tropical lagoons, prime snorkeling, Howell Key, Sugarloaf Key and finally, the fun-loving maritime capital of Florida, Key West. Arrive early and don't miss the sunset celebration at Mallory Square! H: Biscayne. Revolving around the clear waters of Biscayne Bay, this region features lighthouses, museums, islands, palm-lined beaches, balmy winter weather and international cultures. A popular destination is the mangrove-lined Oleta River in north Miami. Starting at John Pennekamp Coral Reef State Park, you'll begin paddling one of the most pristine areas in coastal South Florida. Mangrove lined shorelines, shallow patch reefs and colorful fish will be your companions for many miles as you explore Pennekamp, Biscayne Bay and Biscayne National Park, the largest marine park in the U.S. national park system. Heading north along the shore you begin to take in the Miami skyline and several local parks offer easy access to shopping and restaurants. From Teacher's Island in Miami, the bay gradually narrows as you head north until you'll see the huge area of mature mangrove forests, framed by large buildings. This is Oleta State Park, terminus for this segment of the trail. A primitive campsite for paddlers is a short ways up the Oleta River, on the north side. This campsite is currently being renovated, so a temporary paddler's campsite has been set up in the park. Contact: Contact our Region H Director or Trailkeeper for more information by clicking here. Even though this is a short urbanized segment along south Florida's Gold Coast, paddlers can enjoy several scenic state parks. 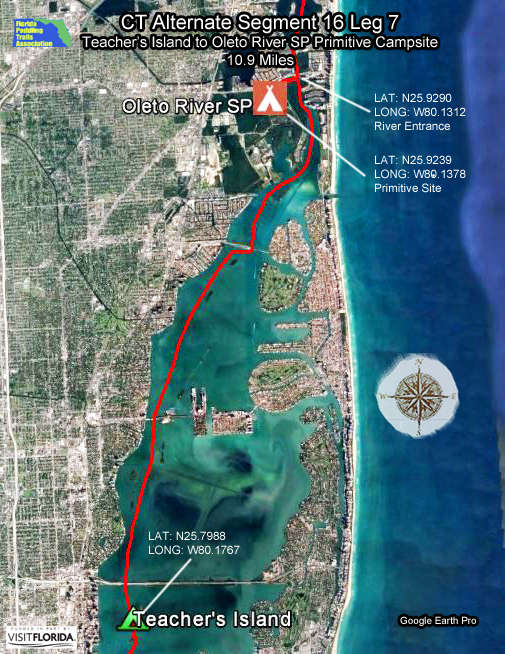 Starting from Oleta River State Park, you'll have an opportunity to paddle either the Intracoastal Waterway (ICW) or along Atlantic beaches. We recommend taking the Atlantic route only during good weather and light winds. 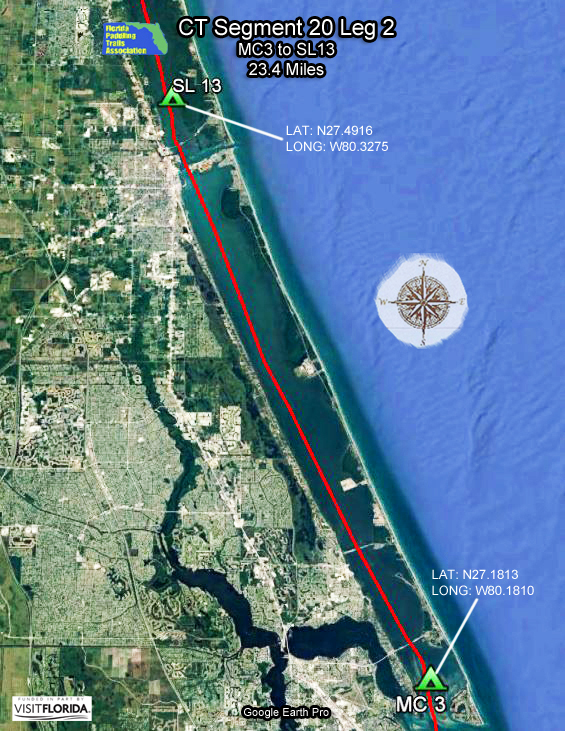 Those trying the Atlantic will need to backtrack to Baker's Haulover Canal, then proceed north. 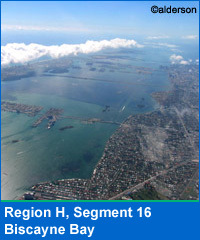 The next opportunity to reenter the ICW is the busy entrance to Port Everglades. 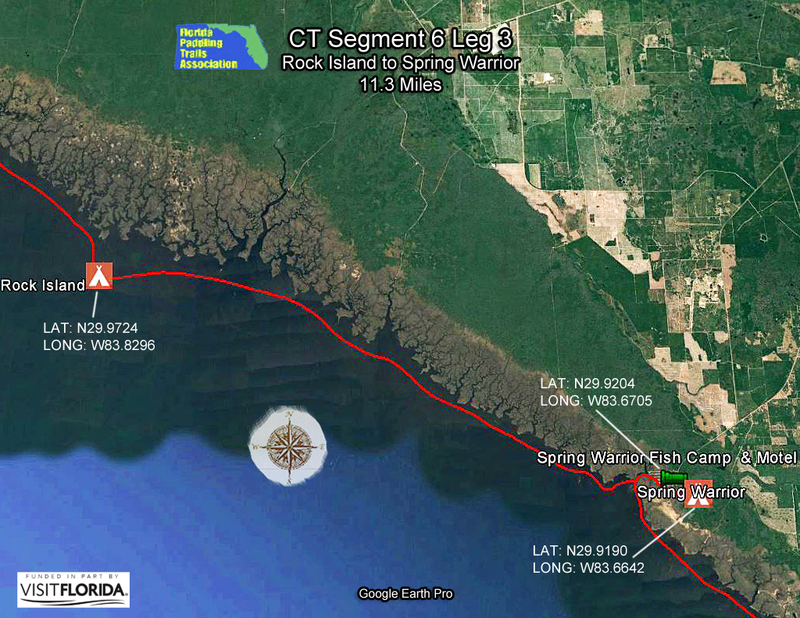 For ICW paddlers, the first stop is Holland Park, seven miles north of Oleta. The park has picnic shelters and makes a fine lunch stop. From Holland Park continue north to the Ann Kolb Nature Center (a must see!) and then on to the John U. Lloyd State Park. Bring a mask and snorkel as you'll find one of the easiest and most interesting shore dives in the area. The final stop, and end of this segment is Hugh Taylor Birch State Park. Take special care when proceeding past Port Everglades, where gargantuan cruise ships and other boats dock. 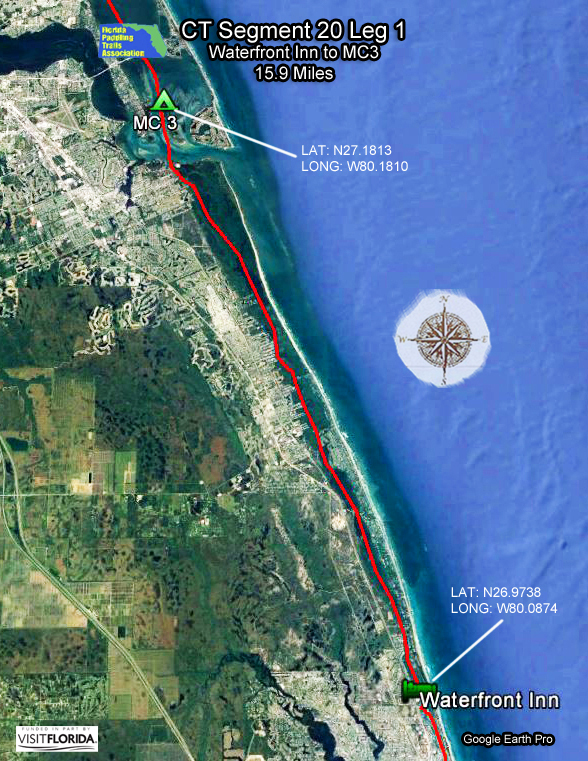 Given the narrow Intracoastal Waterway, lengthy stretches of seawalls and heavy boat traffic, this is a challenging segment and recommended for paddlers who have expertise in paddling over large and high energy wakes. I: The Gold Coast. 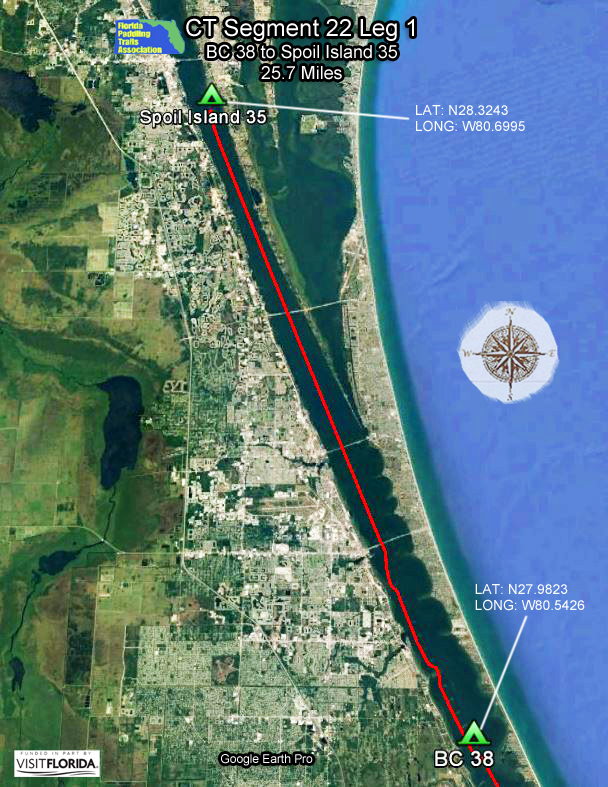 As you head north through this region along the circumnavigational trail, the narrow Intracoastal Waterway begins to open up into the Lake Worth Lagoon and the Indian River. A huge draw is Florida's first wild and scenic river - the Loxahatchee - with its virgin cypress and historic trapper's cabin. 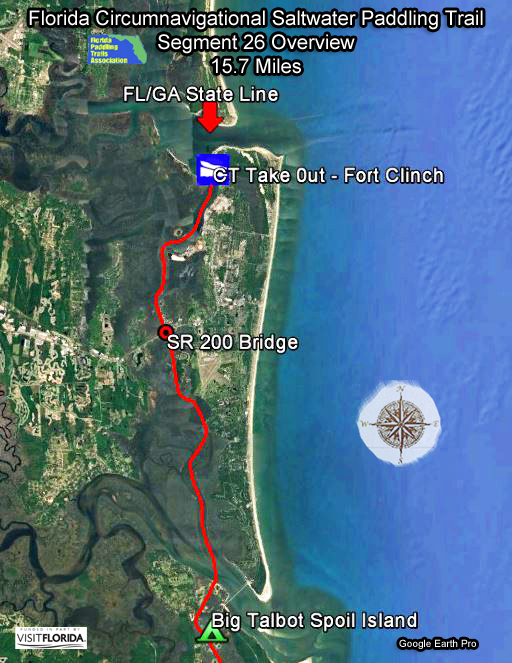 Starting at the Hugh Taylor Birch State Park, paddlers have the option of paddling the Intracoastal Waterway (ICW) or the Atlantic shore, depending on wind, weather and preference. In calm weather, the Atlantic may be safer until the ICW begins to widen north of the Boynton Inlet. 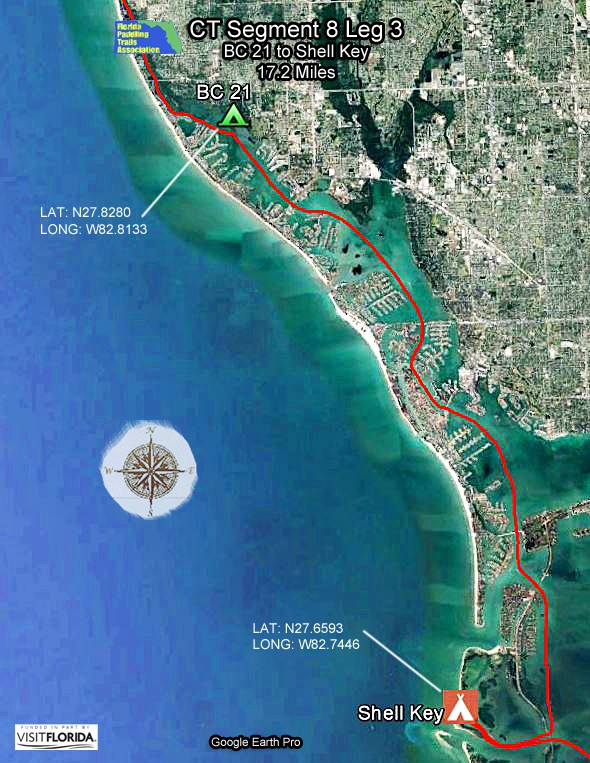 ICW paddlers will pass through many popular areas including Lauderdale by the Sea, Hillsboro Beach and Lake Boca Raton. Along the way are some great local parks including the Gumbo Limbo Nature Center (at Red Reef Park) and the Spanish River Park. 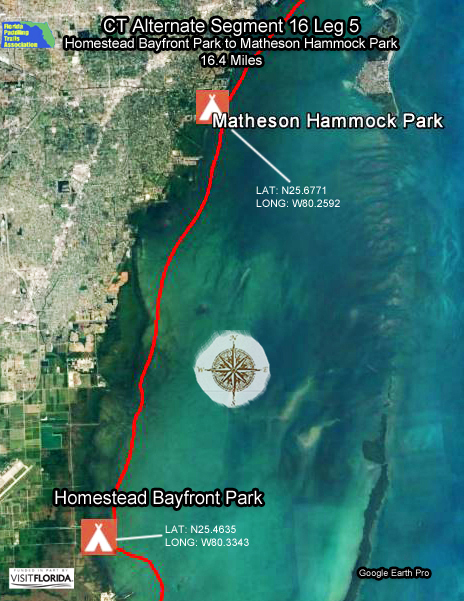 Before landing at the nature center beach, you must first obtain permission by calling 561-338-1473. The Red Reef Park (Atlantic side of Gumbo Limbo) features a man-made reef about 10 feet offshore, where even beginning snorkelers can catch sight of tropical fish, turtles, eels and stingrays. This segment ends near the Hwy 802 bridge in Lake Worth. Local parks with take-outs can be found on both sides of the bridge or those seeking overnight lodging can find a room at local motels. Contact: Contact our Region I Director or Trailkeeper for more information by clicking here. 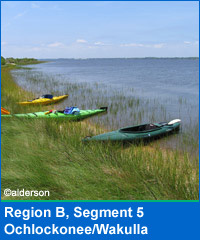 Where the ICW is narrow and lined with seawalls, paddlers must be wary of large boats. In addition to motorboat operators not paying attention, resulting in possible collision, boat wakes often rebound off sea walls causing difficult paddling conditions. 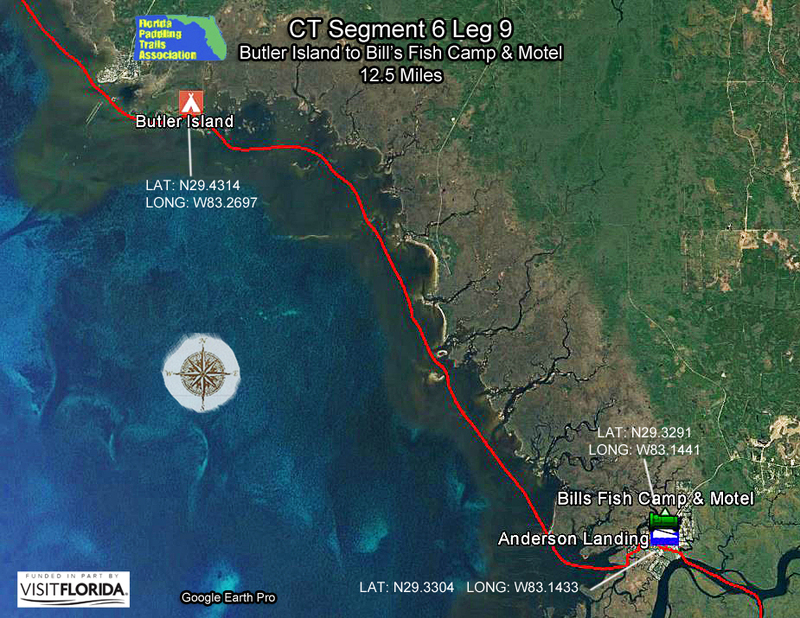 Campsites are not available and staying at a hotel or motel may be required for those paddling the entire length of the segment. Most hotels and motels have docks constructed for sail and motorboats and not paddlecraft. At low tide expect the distance to be 3 to 4 feet from the water to the platform, making entry and exit challenging. 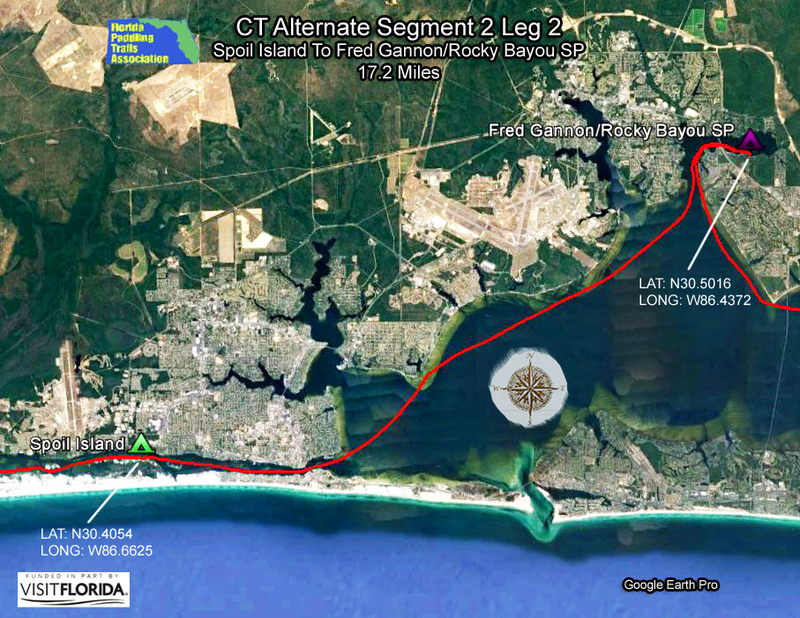 Paddlers on the Atlantic shore will need to access the ICW at Boynton Inlet in order to reach the motel for day two. This segment on the Gold Coast may only be 29 miles in length but covers tremendous ground in historical sites, wonderful state parks and aquatic preserves. 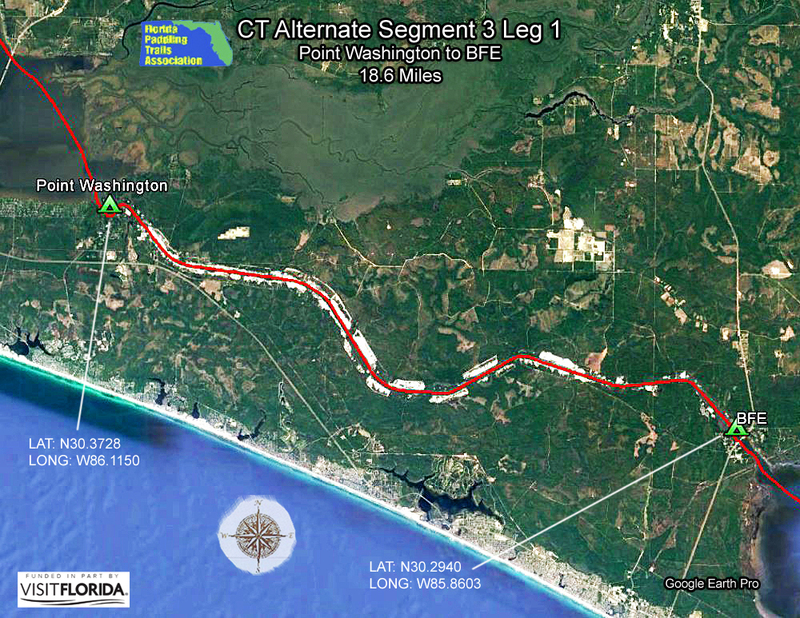 Paddlers completing the entire trail will start by going south to north, along the Intracoastal Waterway (ICW). The put-in is near the Highway 802 bridge in Lake Worth. 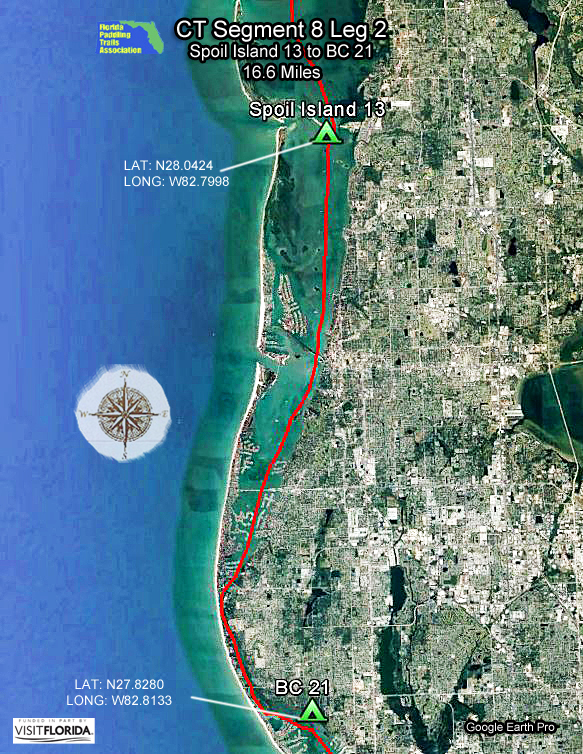 After eleven miles of paddling through Lake Worth and past developments, golf courses and marinas is Peanut Island. The 86-acre site offers camping (make reservations early! ), nature trails, a maritime museum and best of all, the John F Kennedy Bunker, constructed as a temporary command post during the Cuban Missile Crisis of 1962. Three miles north of Peanut Island is the John D. MacArthur Beach State Park, featuring a unique mixture of coastal and tropical hammock and mangrove forest on a barrier island. Here the ICW bears left and narrows for a long stretch before opening up into the Loxahatchee River and eventually into the Jupiter Inlet. The segment terminates at the Jonathan Dickinson State Park and River Campground. It's about 5 miles up the Loxahatchee River from the inlet. The Loxahatchee was Florida's first federally designated wild and scenic and one of only two currently in the state. After embarking from Riverbend Park, one can quickly see why. Massive cypress trees form a scenic canopy. Alligators, wading birds and turtles are commonly seen. And besides the twisting tannin-tined waterway, there is a fascinating historical stopover spot at the Trapper Nelson's cabin. Be wary of large boats and their wakes while in the Intracoastal Waterway (ICW). Boat wakes often rebound off sea walls, making paddling difficult. Boat traffic is higher on weekends and holidays. Do not tie kayaks to docks along the ICW as boat wakes may cause swamping or damage; always lift them out of the water. There can be snags in the upper Loxahatchee River, so some careful negotiations and pullovers are necessary. Contact the state park or local outfitters to check on conditions. J: Indian River / Kissimmee River. The scenic Indian River, with its high level of biodiversity, is the dominant natural feature in the coastal region. 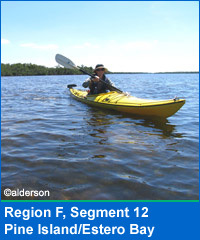 Other paddling trails include Turkey Creek, and the South Fork of the St. Lucie River. 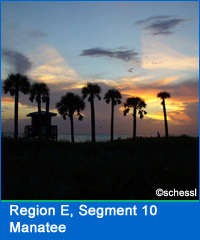 This segment features four state parks on Florida's Gold Coast: Jonathan Dickinson, St. Lucie Inlet Preserve, Seabranch Preserve and Ft. Pierce Inlet. All are accessible from the ICW and good spots to explore. Only Jonathan Dickinson has a regular campground that is available to solo or small groups of paddlers. 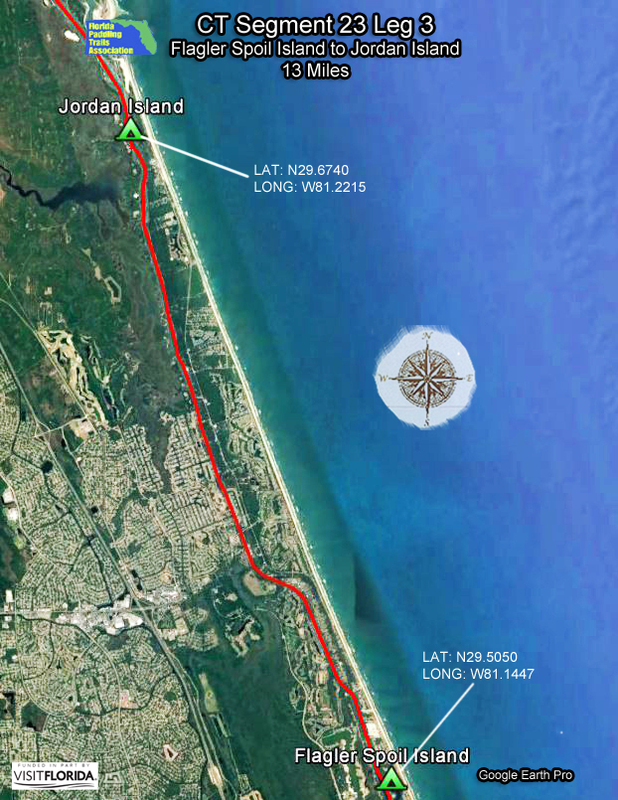 Starting at Jonathan Dickinson, paddlers will go 5 miles down river to the ICW and Jupiter Inlet. The inlet marks the southern end of the 155-mile Indian River Lagoon. 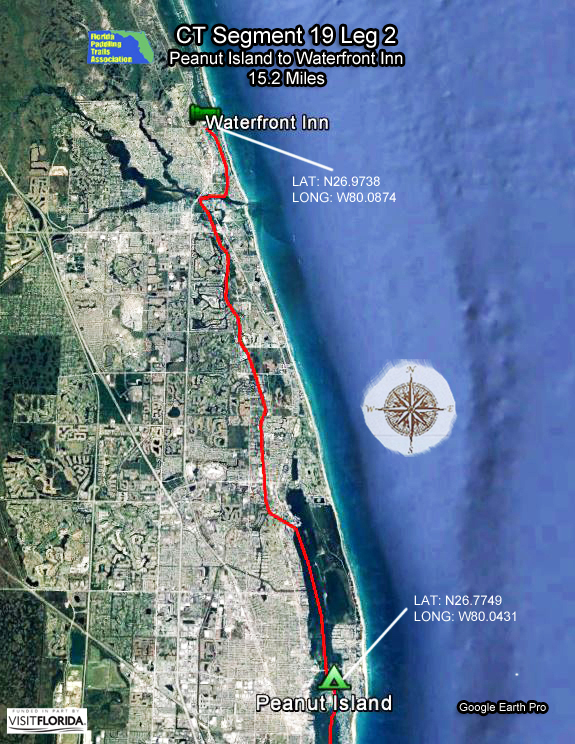 Those desiring a shorter day one trip can begin at the Jupiter Waterfront Inn, shaving 7 miles from the trip. 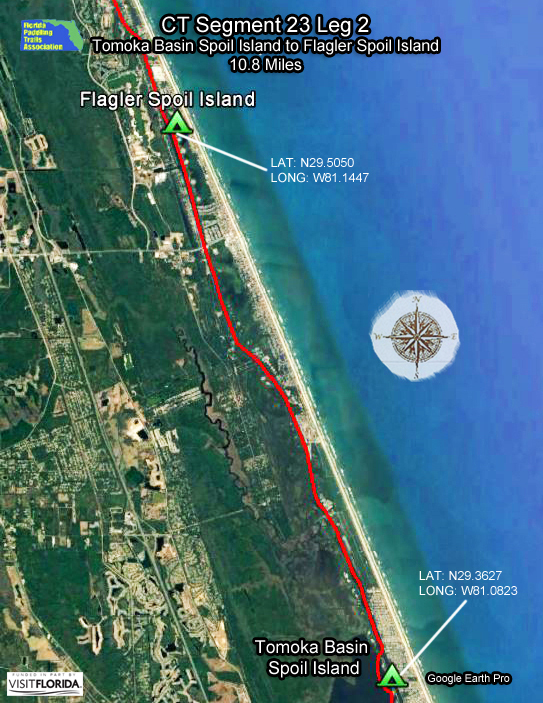 Heading north from the Inlet, paddlers will be treated to the Florida east coast treasures of Coral Cove Park, Blowing Rocks Preserve and 1000-acre Hobe Sound National Wildlife Refuge. This day ends at the large "MC3" spoil island. It's usually high and dry for camping. 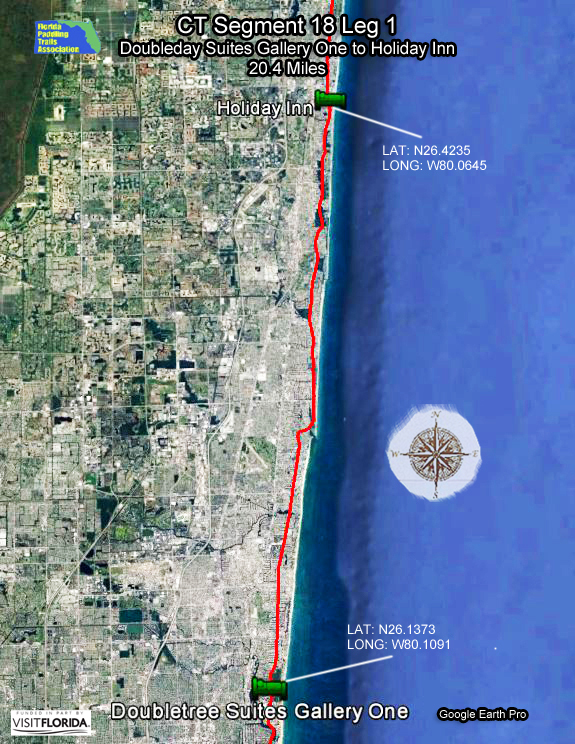 Day two of this segment is a 21-mile stretch along the Indian River between the mainland and Hutchinson Island. Here the river is up to two miles wide, far different from the narrow ICW paddled in earlier east coast segments. Fort Pierce Inlet State Park marks the end of this segment. The South Fork of the St. Lucie River is a gentle stream that flows through a brackish oak hammock. The upper reaches are undeveloped and paddlers often spot manatees, otters, osprey, alligators, turtles and a host of wading birds. An outfitter is conveniently situated on the river. Contact: Contact our Region J Director or Trailkeeper for more information by clicking here. 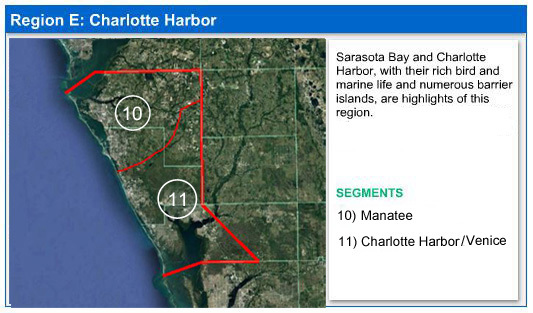 Special precautions should be taken in the narrow portions of the Intracoastal Waterway (ICW) regarding boat traffic. Lack of camping opportunities and the erosion of some spoil islands are the reasons for the 20-plus miles that need to be covered each day. 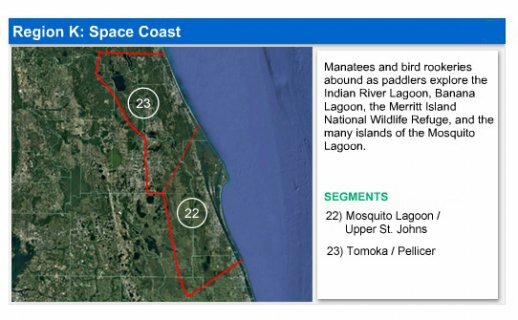 Covering the middle section of the Indian River Lagoon, considered to be North America's most diverse estuary, this segment incorporates premier state and county parks, federal land, side rivers and streams, numerous spoil islands and a traditional fish camp. Paddlers are almost guaranteed to spot sea turtles, manatees, dolphins and a wide variety of bird life. 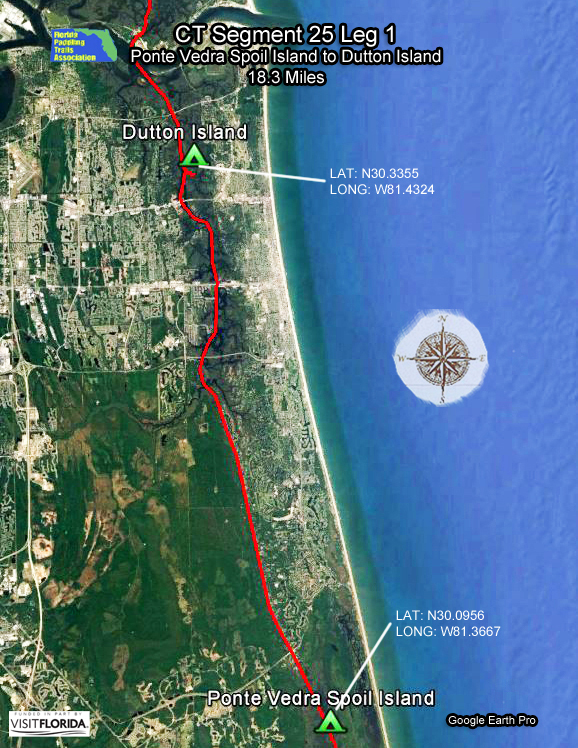 On the circumnavigational trail, you can start this segment from the sandy Dynamite Point beaches at Ft. Pierce Inlet State Park. Here U.S. Navy Frogmen trained for the D-Day invasion in World War II. 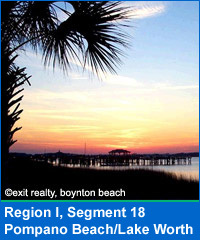 Immediately north of the park is the 1A bridge and Pepper Beach State Recreation Area. While there are numerous spoil islands on this stretch, the best camping is near Gifford Point, 14 miles away. Day two starts by heading north along the ICW toward Pine Island, Wabasso and Pelican Island, America's first National Wildlife Refuge. Camp near the town of Sebastian on spoil island #IR5. 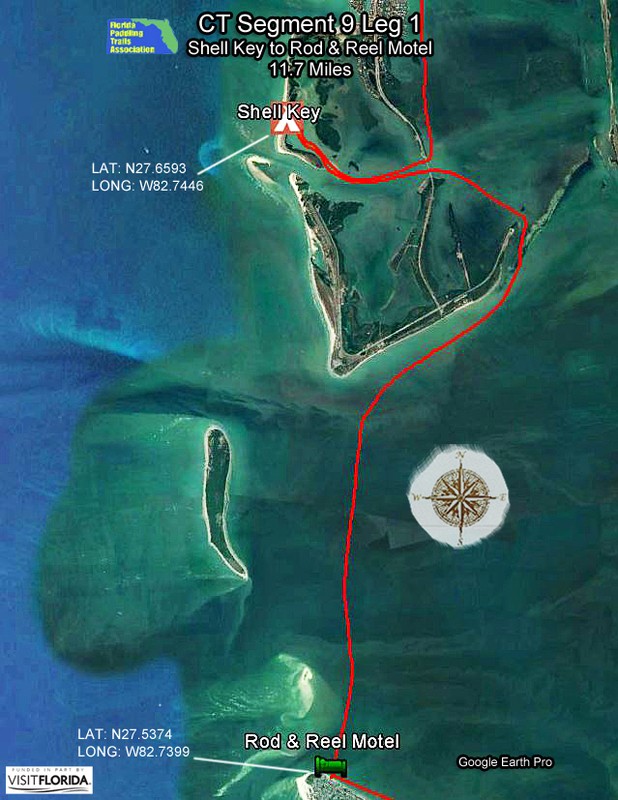 From here it is a little over 20 miles to the final take-out at Front Street Park in Melbourne, or you can break this stretch into two days by staying at spoil island #BC38, after 13 miles of paddling. For interesting side trips, you can paddle along the high sand bluffs of Turkey Creek, observing numerous manatees, or you can explore the wildlife-rich prongs of the Sebastian River. Boat traffic can be heavy along the Intracoastal Waterway (ICW), especially on weekends and holidays. Paddling along the high energy East Coast shoreline is not recommended due to safety considerations. Conditions can change abruptly and few inlets allow paddlers to move to sheltered waters. Paddling the Sebastian Inlet is HIGHLY DISCOURAGED as the current has been measured up to 9.1 feet per second at maximum ebb! Stay far away from the Inlet. K: The Space Coast. Manatees and bird rookeries abound as paddlers explore the Indian River Lagoon, Banana Lagoon, the Merritt Island National Wildlife Refuge, and the many islands of the Mosquito Lagoon. 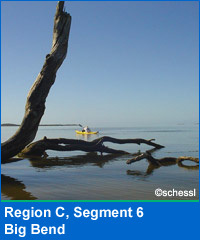 The Upper St. Johns River is the dominant feature through the interior part of this region. 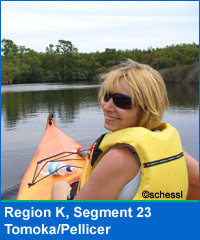 Other paddling trails include Spruce Creek, Bulow Creek, and the Pellicer and Tomoka Rivers. 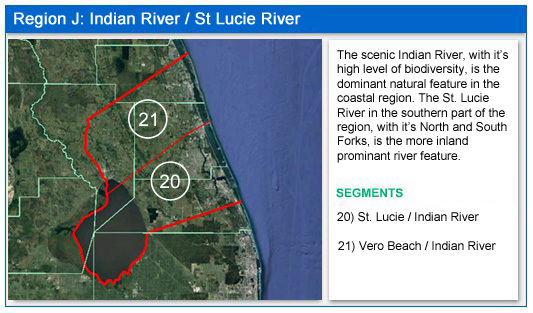 The Indian River Lagoon is considered to be North America's most diverse estuary. Overlapping tropical and subtropical climates have created an ecosystem that supports more than 4,300 plants and animals. 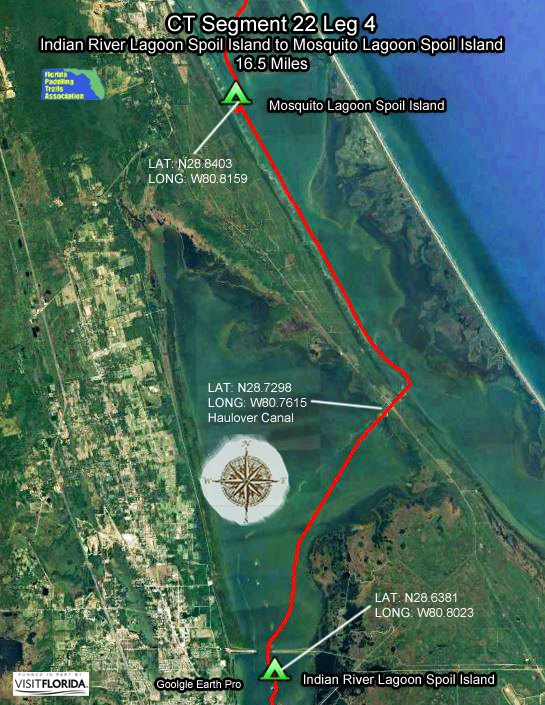 Another prime paddling area is Mosquito Lagoon, a place of unspoiled islands and tidal creeks that is sheltered from the Atlantic by Cape Canaveral and Merritt Island. This estuary is a vital nursery for fish, oysters, clams, shrimp and other sea life and, not surprisingly, it's one of Florida's most famous fishing grounds. 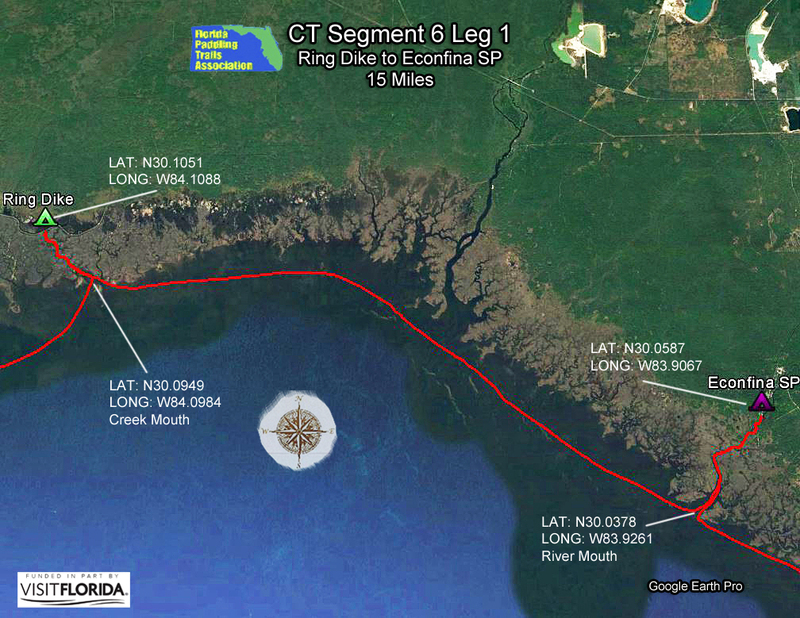 The famous St. Johns River begins in this segment and winds north through vast wetlands. At 310 miles, this is the longest river in Florida and one of the few in the country that flows north. While people have paddled the wild upper reaches of the St. Johns, there is no handy guidebook at the moment to help paddlers navigate. 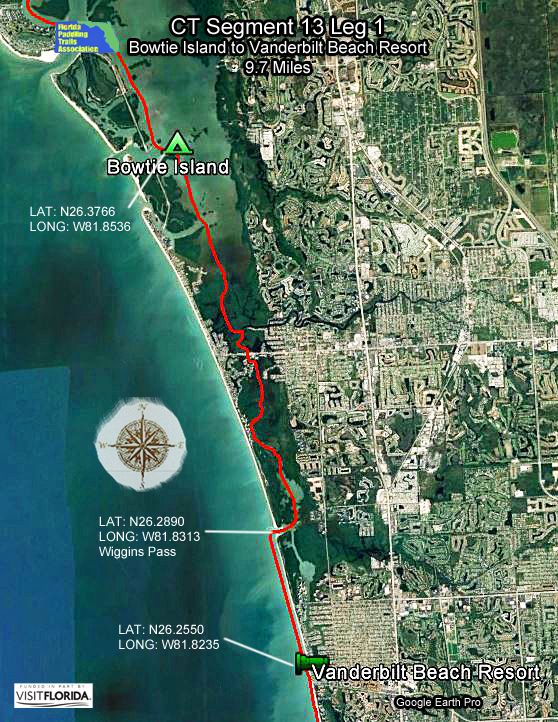 The circumnavigational trail in this segment starts at Melbourne's Front Street Park and the first stretch involves paddling a relatively wide and straight part of Indian River Lagoon to Island #35, some 18 miles to the north. 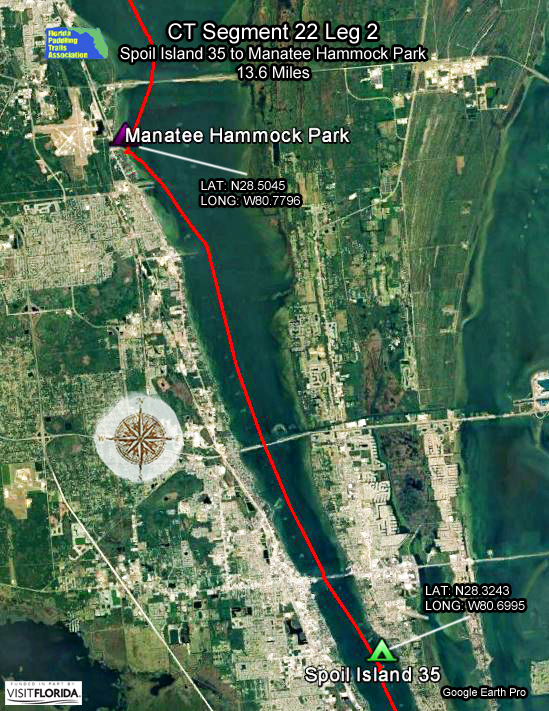 The next overnight stop for long distance paddlers is Brevard County's Manatee Hammock Campground and then it's back in the boat and on to Titusville. Be sure to load up on freshwater, as there is no available source for the next two days. 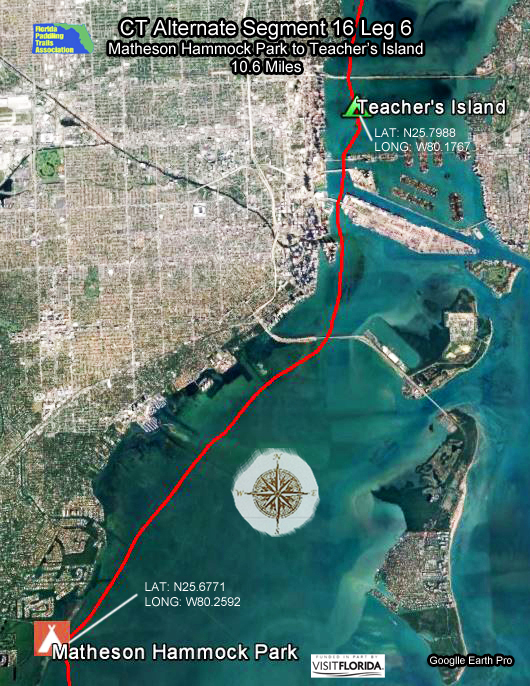 Past Merritt Island and the John F Kennedy Space Center you'll reach Haulover Canal. 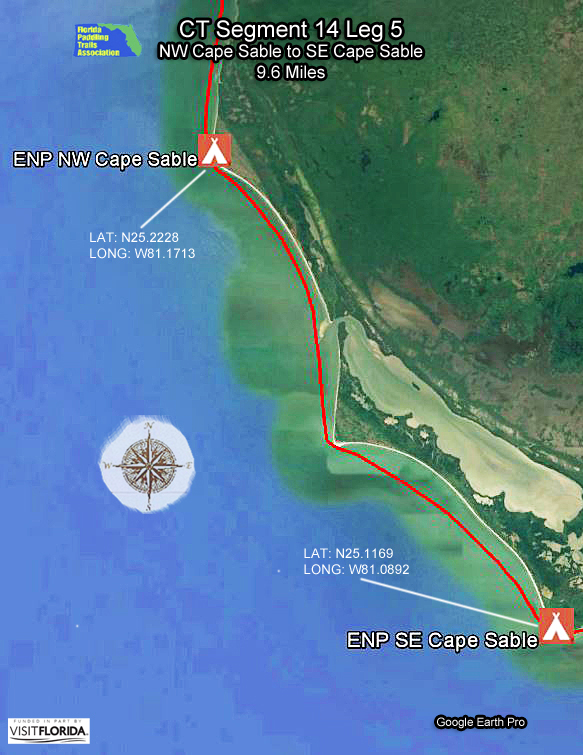 This is the point where you'll need to cross into the Mosquito Lagoon and Canaveral National Seashore. Be sure to stop at the Eldora Statehouse and Shipyard Island. 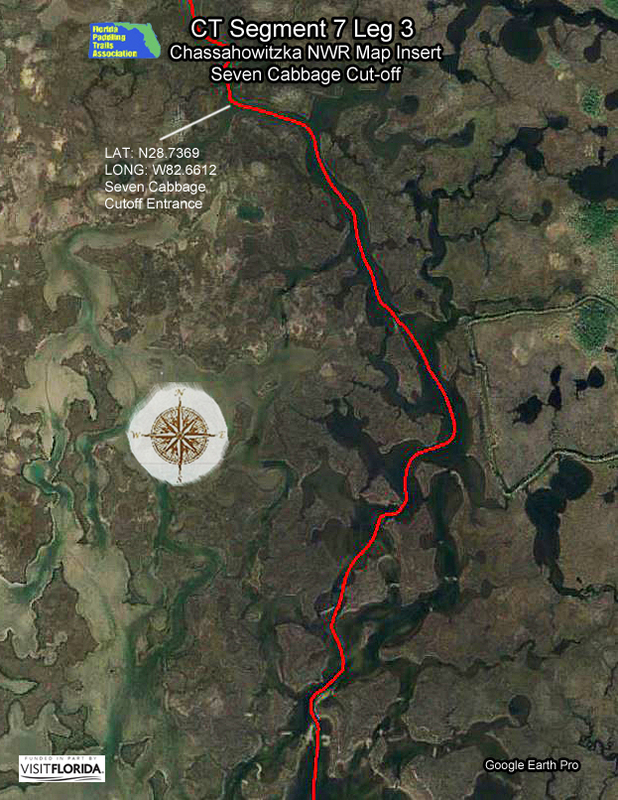 The terminus of this segment is Smyrna Dunes Park, 13 miles north of Shipyard Island. Contact: Contact our Region K Director or Trailkeeper for more information by clicking here. Paddling along the high energy East Coast shoreline is not recommended due to safety considerations. Conditions can change abruptly and there are few inlets to allow paddlers to move to more sheltered waters. The Tomoka / Pellicer segment is rich in history, ecology and scenic beauty. Paddlers can enjoy scenes that have changed little since Timucuan Indians plied these pristine estuarine and riverine systems in their dugout canoes. For those interested in more contemporary times, five outstanding state parks are within easy reach, along with Florida's tallest lighthouse at Ponce de Leon Inlet. 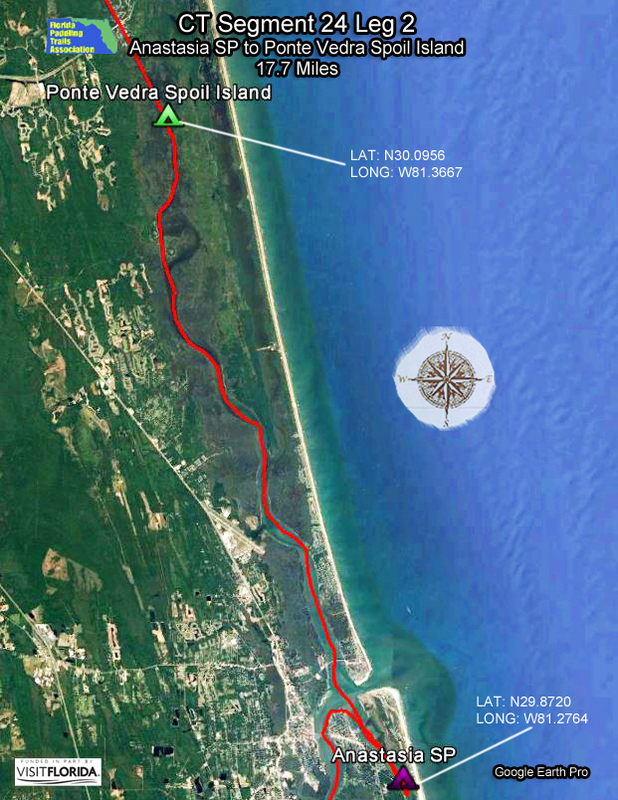 Circumnavigational trail paddling starts at Smyrna Dunes Park near the Ponce Inlet. For those camping nearby, numerous spoil and natural islands are available within the wide Halifax River basin, as well as camping at the developed Spruce Creek County Park. 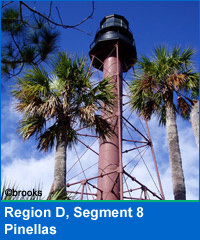 There are several rest stops along the route north including the Ponce lighthouse and the Port Orange Causeway Park (A1A Bridge). 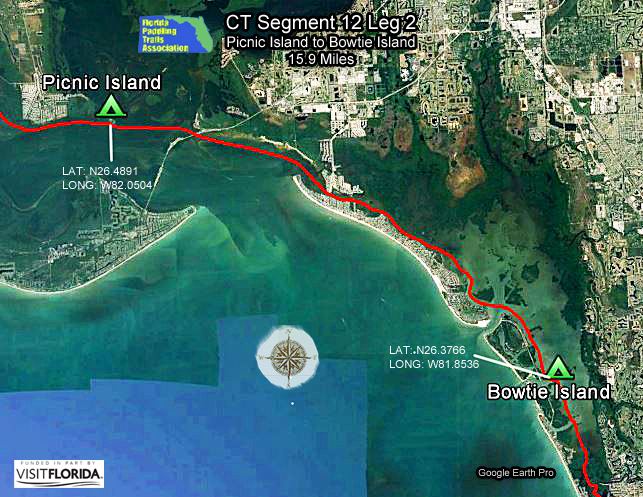 From here it is 14 miles to the Tomoka Basin islands in Ormond Beach. 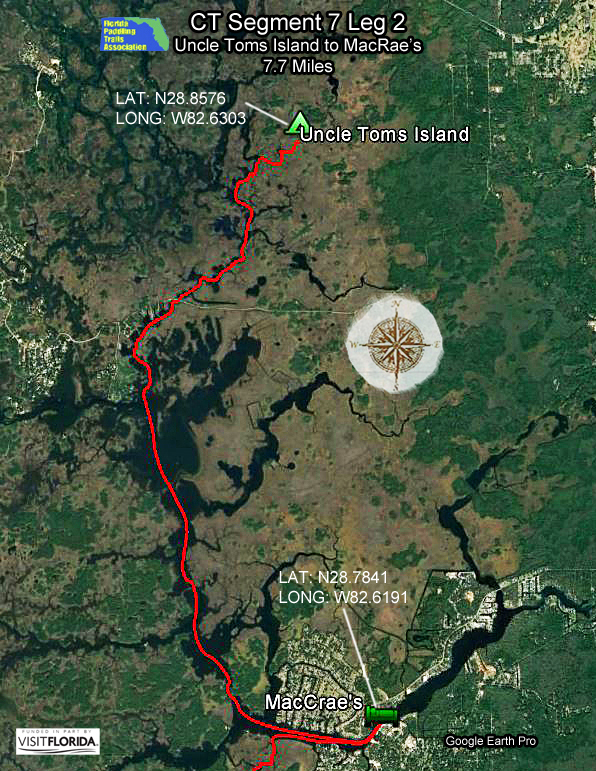 After the Tomoka Basin, the Halifax River suddenly narrows and morphs into Halifax Creek, then into Smith Creek, and finally into the Matanzas River. The Matanzas eventually widens in the Pellicer Flats. Camping is available at Mellon Island, located a short distance from Marineland. Rivers such as the Tomoka and Pellicer have undeveloped sections that flow primarily through public lands. The upper sections are lush and canopied while the lower ends are tidally influenced and offer marshy vistas. Bulow Creek gives an added plus of flowing past the ruins of an historic plantation and sugar mill. 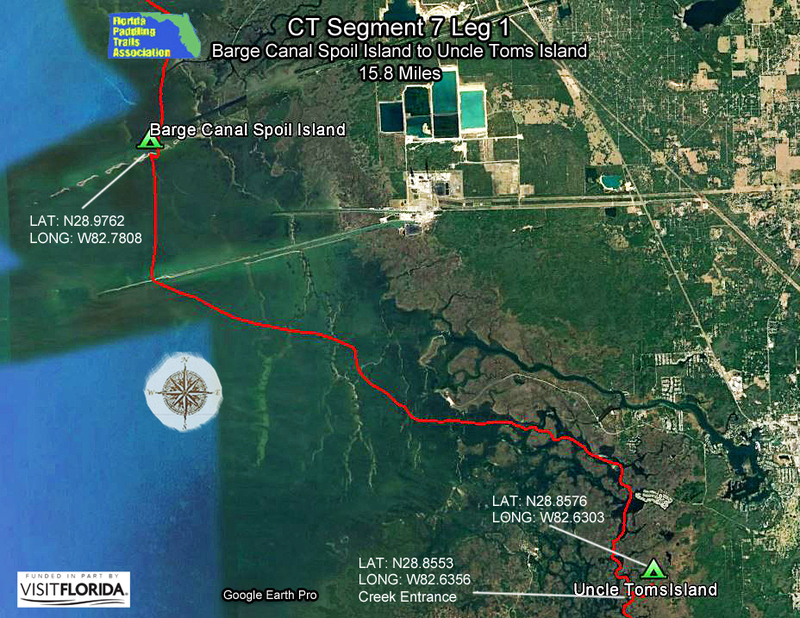 Tomoka Basin Spoil Islands to Flagler Spoil Island, 10.8 miles. Paddling along the high energy East Coast shoreline is not recommended due to safety considerations. Conditions can change abruptly and few inlets allow paddlers to move to more sheltered waters. L: The First Coast. From the rich history of North America's oldest European-founded city—St. Augustine—to a civil war fort along the Georgia border, this region boasts unspoiled stretches of public lands and numerous sea islands and winding tidal creeks. Rivers include the lower St. Johns, Nassau and St. Marys. This segment of the circumnavigational trail is steeped in history and blessed with outstanding natural beauty. Here Spain, France, England, the U.S. and Native American tribes wrested for control of Florida through the historic city of St. Augustine. Paddlers can literally touch this history by visiting many sites along the route. 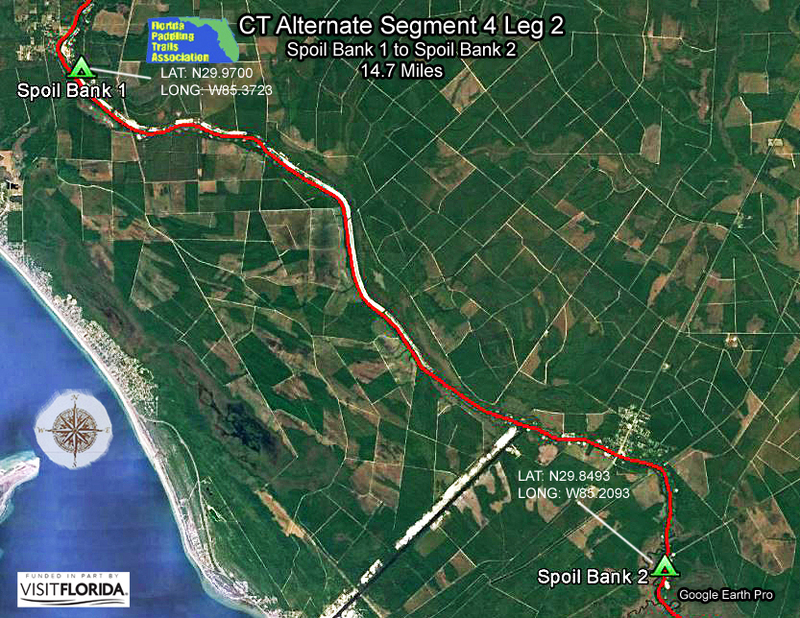 The segment starts at Mellon Island or Faver-Dykes State Park, depending on where you put-in. Nearby (but some back-tracking) is Marineland, the world's first oceanarium. 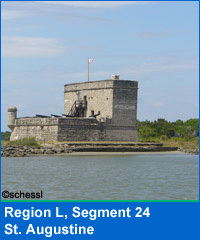 Heading north on the old channel of the Matanzas River just past Mellon Island you can access the Fort Matanzas National Monument. Land near the dock along the east side of the river to tour the visitor's center and take a park service ferry over to the historic fort. Landing near the fort on Rattlesnake Island is not allowed. Next stop, and a great place to spend the night, is St. Augustine. The Old Town and fort Castillo de San Marcos are favorite areas to explore in the city. Ghost Tours, Ripley's Believe it or Not and many other attractions are within easy walking distance of the St. Augustine Municipal Marina. 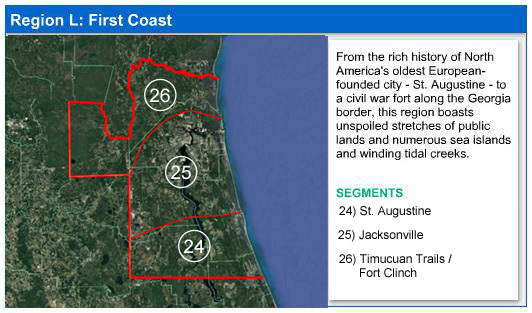 The end point for this segment is Palm Valley Road, 19 miles to the north of St. Augustine. Much of the land on the east side of the ICW along this final stretch is the Guana Tolomato Matanzas National Estuarine Research Reserve. Paddlers also enjoy paddling for several miles along the Guana River and Lake Ponte Vedra. 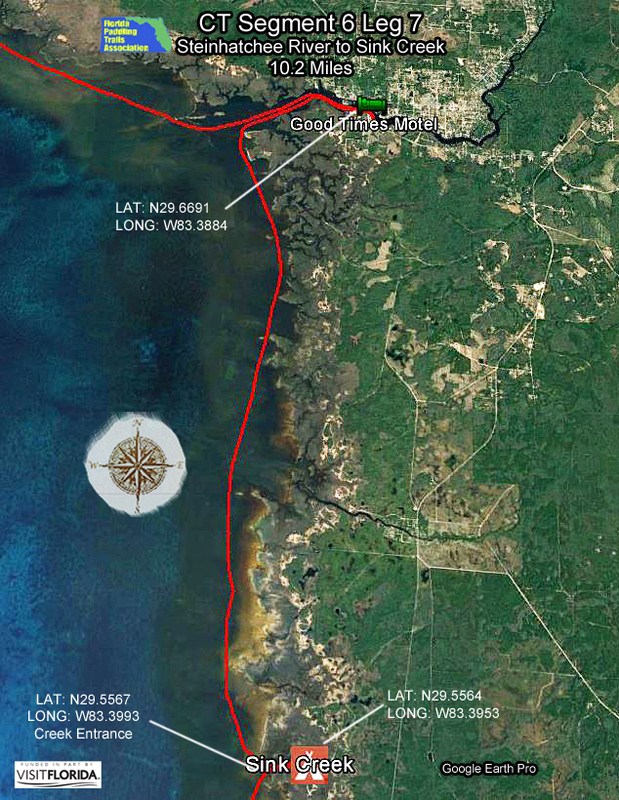 A portion of the St. Johns River from Palatka to Green Cove Springs runs through this segment. The river here becomes more than two miles wide, so stay along one shore or the other depending upon prevailing winds. Contact: Contact our Region L Director or Trailkeeper for more information by clicking here. 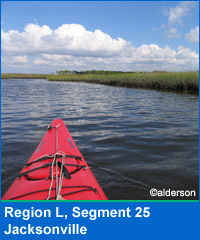 While this segment covers one of the largest urban areas in the state, paddlers will find vast stretches of marsh, islands, beach and coastal forest in prime condition. Helping drive the effort to save environmentally sensitive lands, the City of Jacksonville founded "Preservation Project Jacksonville" in 1999. 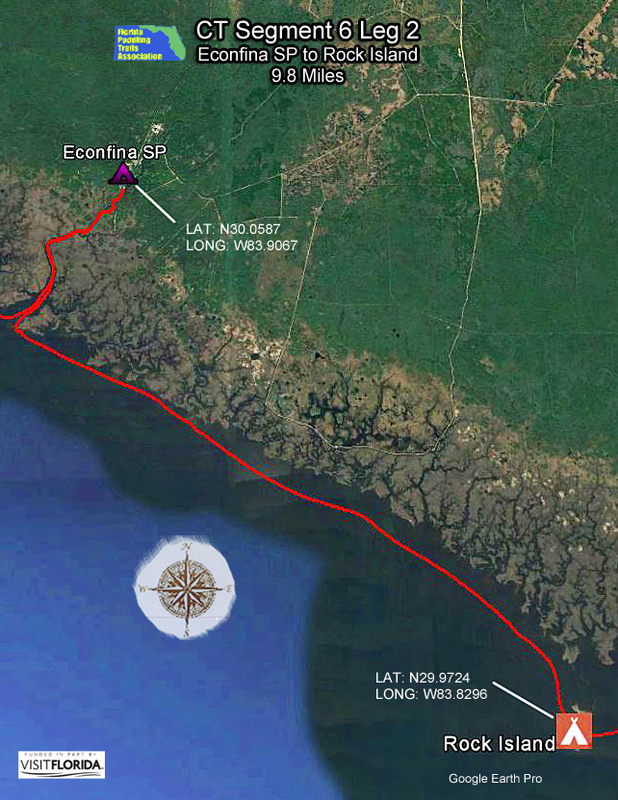 The project has already acquired over 50,000 acres. 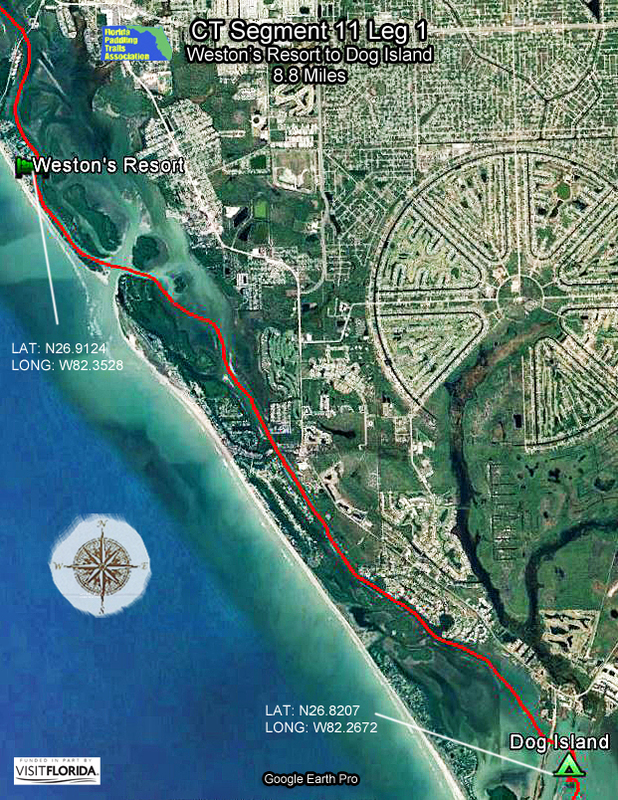 This segment begins at Palm Valley Road, near the Guana Tolomato Matanzas National Estuarine Research Reserve. Heading north, the ICW goes straight and narrow for about nine miles along private land and the Guana River Wildlife Management Area. The west bank is relatively unspoiled and about halfway to the Hwy 202 bridge you pass TPC at Sawgrass, home to the PGA "THE PLAYERS" golf championship. The ICW widens after the Hwy 202 bridge and becomes more natural looking, with numerous tree islands, tidal creeks and unbroken expanses of marsh. It is here that you'll be in the Northeast Florida Blueways, a scenic network of island preserves, tidal creeks and salt marshes along the ICW from Atlantic Beach to South Jacksonville Beach. 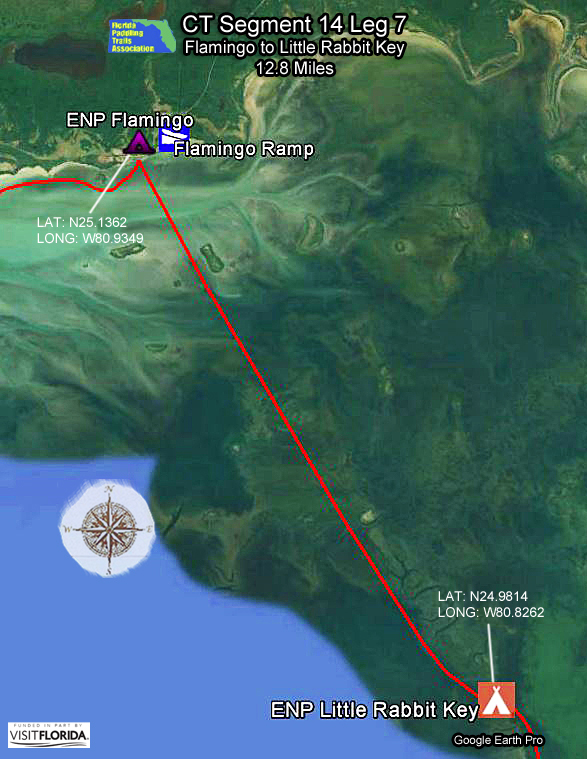 Proceeding north in the ICW, past Tideways and Dutton Islands you'll eventually reach Pablo Island, a small tree-covered spoil area. Sister's Creek Marina in the St. John's River basin is the take-out for this segment. 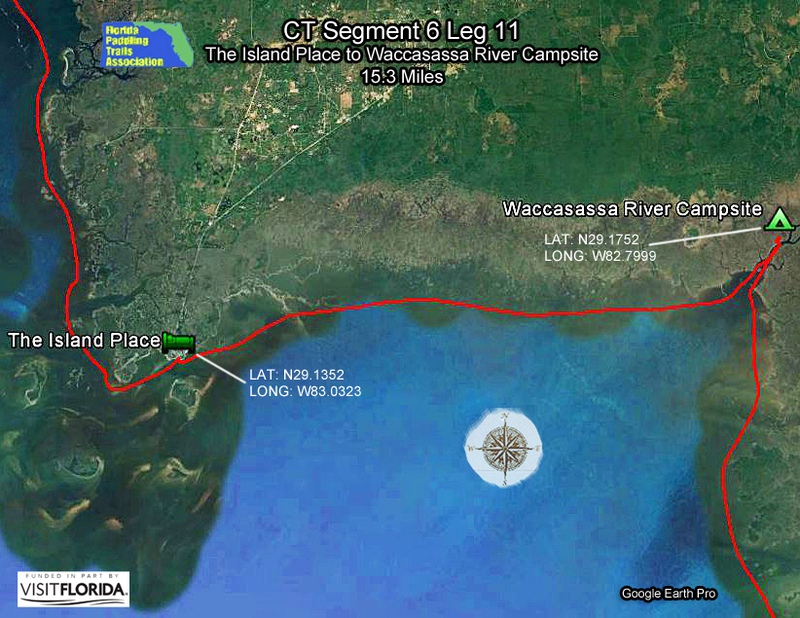 There are no inlets in this segment connecting the ICW to the Atlantic with the exception of the St. Johns River. Jetties that extend almost two miles into the Atlantic along the mouth of the St. Johns make this option prohibitive. Paddlers in the ICW must often contend with a strong easterly shore breeze. 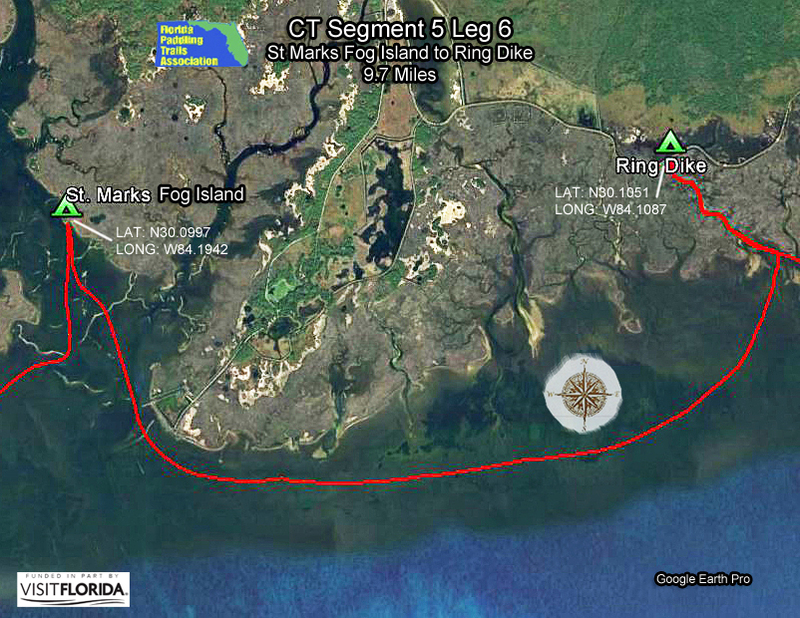 Fort Clinch State Park marks the eastern end of the Florida Circumnavigational Saltwater Paddling Trail. Along this final segment you can experience five state parks: Fort George Island, Little Talbot Island, Big Talbot Island, Amelia Island and Fort Clinch. Besides paddling, opportunities for hiking, swimming, biking and fishing abound. Sister's Creek Marina on the St. John's River is the put-in for this segment. From the marina go north on Sister's Creek and four miles later head east at the Fort George River. Fort George Island Cultural State Park makes a great lunch stop. 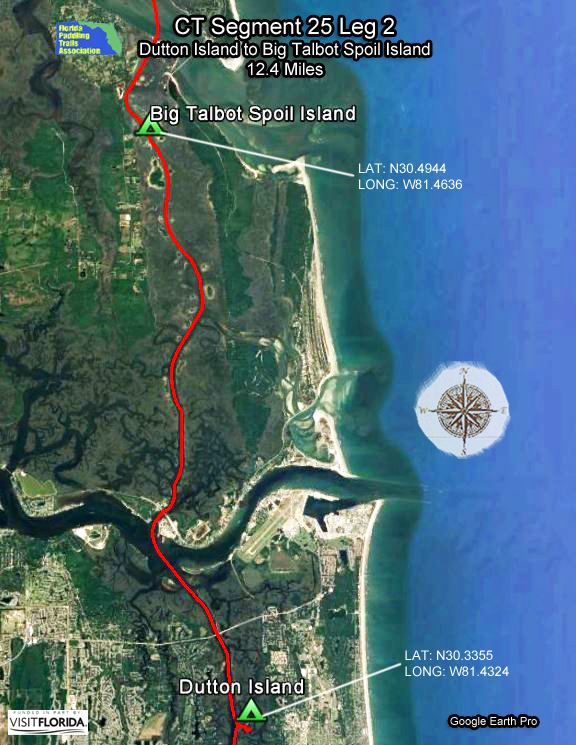 From here the trail heads up Simpson Creek for a mile, and then Myrtle Creek to Little Talbot Island State Park. 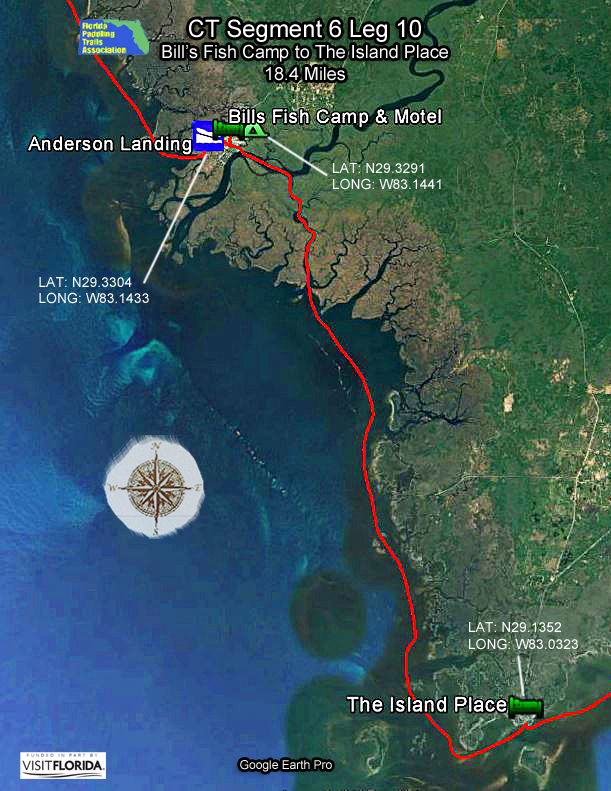 Day two involves backtracking to Simpson Creek and following it to Nassau Sound, Bird Island and eventually on to Big Talbot Island. Here scenic bluffs make for a great hike and picnic. 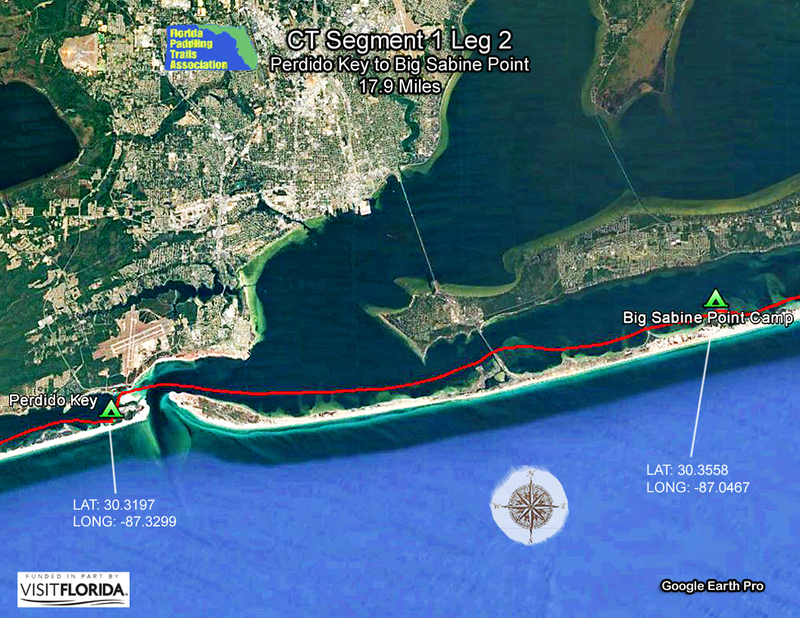 Downstream, strong currents exist in Nassau Sound and at the entrance of South Amelia River. Next comes Fernandina Beach and Tiger Island near the Florida / Georgia state line. 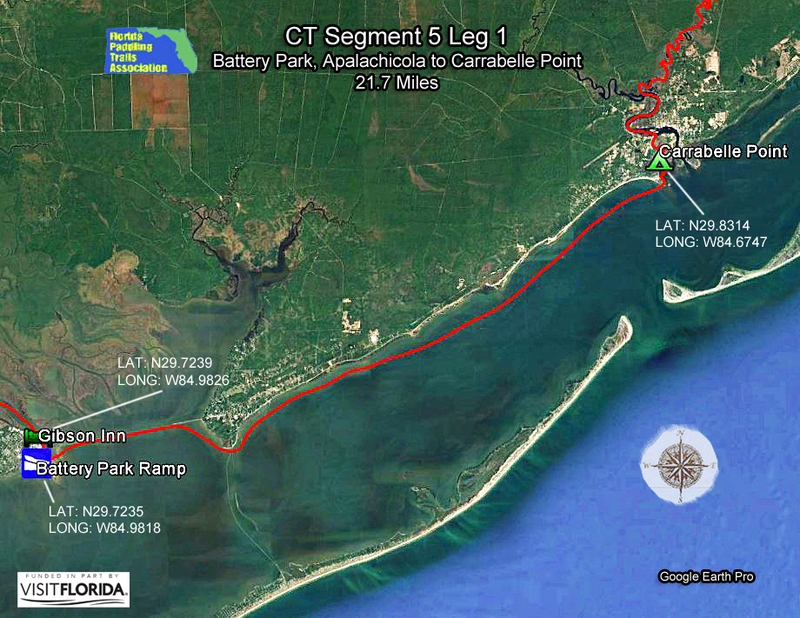 Fort Clinch State Park lies to the east and is the fitting end of the 1,515 mile saltwater trail. Several other paddling trails can be found in the area. 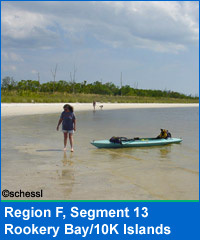 Most make up the Florida Sea Islands Paddling Trails. 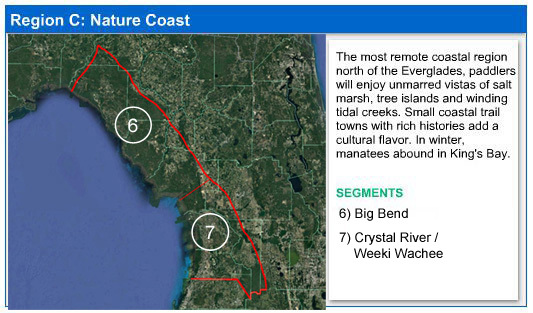 An online guide describes 10 saltwater trails and two freshwater-brackish creek trails. Much of the 125-mile St. Mary's River is also included in this segment. Born in the Okefenokee and Pinhook swamps, the tannin waters of the St. Mary's flows in several directions before reaching the Atlantic. Be sure to check water levels before embarking on a paddling journey. M: Suwannee. 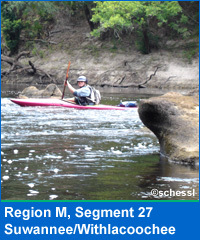 The famed 266-mile Suwannee River dominates this region. The upper river is marked by high bluffs, stately trees and shoals, while the middle section boasts numerous clear springs. 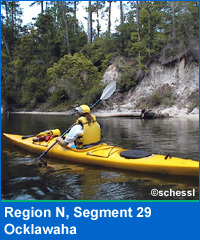 Other paddling trails include springfed rivers such as the Santa Fe, Ichetucknee and Withlacoochee North. 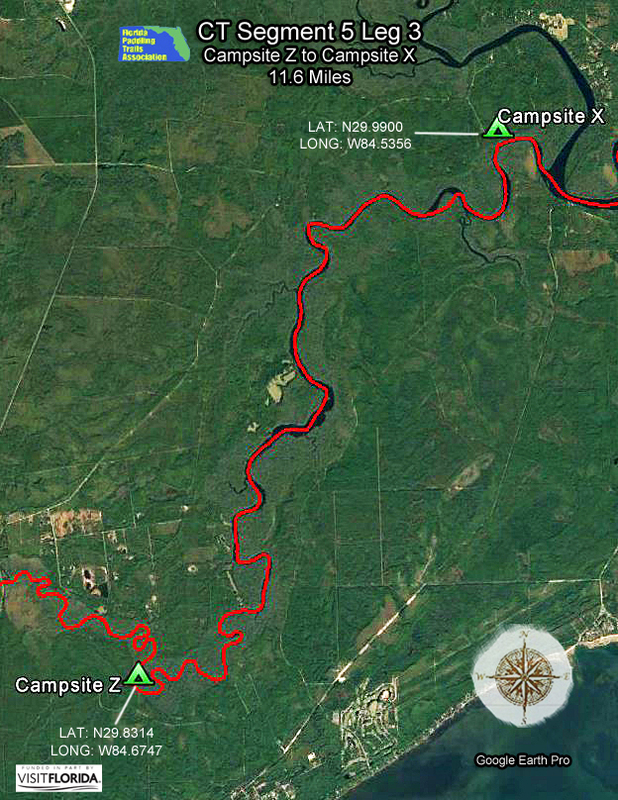 The new Potano paddling trail system near Gainesville is also part of this region. Marked by high bluffs, stately trees and shoals, the upper Suwannee River dominates this section. 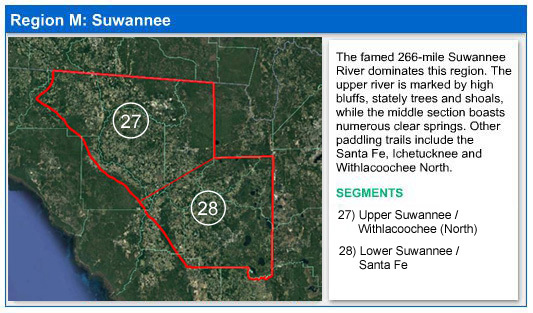 While the actual 170-mile Suwannee River Wilderness Trail begins at White Springs, many paddlers start their long distance journeys on the Suwannee just across the Georgia border at Fargo or at the river's headwaters in the Okefenokee Swamp. Along the established wilderness trail, paddlers can stay at "river camps" where they can choose from screened sleeping pavilions or rustic tent sites, and utilize hot showers, restrooms and electricity. Cabin rentals are available in some locations. At river town "hubs," paddlers can stay in either motels, campgrounds, cabins or bed and breakfasts, and enjoy local restaurants. The Suwannee Wilderness Trail is considered the Cadillac of paddling trails in Florida, a cooperative effort of state of local governments. Contact: Contact our Region M Director or Trailkeeper for more information by clicking here. Boasting numerous clear springs, the lower Suwannee River flows deep and wide along high stately banks to the Gulf of Mexico. Paddlers can take advantage of numerous river "hubs" and river camps along this Cadillac of paddling trails. For more springs and scenic bends, check out the 26-mile Santa Fe River Paddling Trail. The new Potano Paddling Trail system near Gainesville is also worthy of exploration. A major feature is Newnan's Lake, site of the largest find of early Native American dugout canoes in North America during a year 2000 drought. The lake was likely a manufacturing and trading spot for dugout canoes, being strategically located near the center of the state and accessible via small watercourses to the Ocklawaha River, which, in turn, connected to the larger St. Johns River. Large forests of virgin pine and cypress adjacent to the lake provided an ample supply of logs. N: Ocala. The historic Ocklawaha River and its tributaries is a main feature of this region along with a section of the St. Johns River and Lake George. The Ocala National Forest, in the heart of the region, includes several spring fed streams such as Juniper Springs Run, Alexander Springs Run and Salt Springs Run. The wild and beautiful Ocklawaha River, with its dark mirror-like water and unspoiled shorelines, is the dominant feature of this segment. Other paddling trails include the clear-running Silver River with its abundant wildlife and exotic rhesus monkeys. In the late 1800s, small steamboats once plied the waters of the Ocklawaha and Silver Rivers, carrying goods and passengers to and from Jacksonville. Now, canoes, kayaks and small powerboats are the dominant watercraft. Contact: Contact our Region N Director or Trailkeeper for more information by clicking here. The Ocala National Forest is a paddler's paradise with about 600 lakes and ponds, several streams and two rivers. 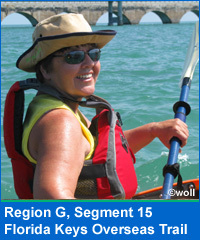 Three popular paddling trails are spring fed. As a result, they usually run clear. Juniper Creek is narrow and canopied by cypress, palms and other trees. Alexander Creek alternates from being a narrow, twisting waterway to a broad, slow moving creek. Salt Springs Run flows several miles before spilling into Lake George. O: Orlando. 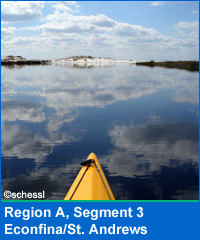 Several state designated paddling trails such as the Wekiva River / Rock Springs Run and Econlockhatchee River are included in the upper part of this region. 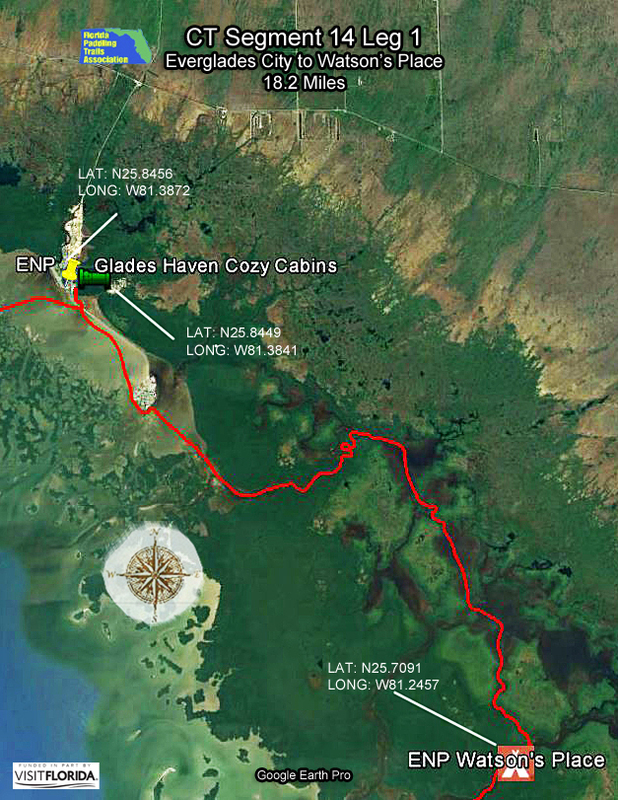 Below Orlando, the interconnected Kissimmee Chain-of-Lakes mark the beginning of the Everglades system. Spring fed and clear, the 27-mile Wekiva River Paddling Trail offers a welcome relief from Orlando congestion. Otters, wading birds, alligators and an occasional Florida black bear can be seen. 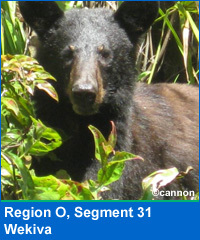 A variety of habitats, ranging from swamps and hammocks to sand pine scrub and pine flatwoods, can also be experienced. 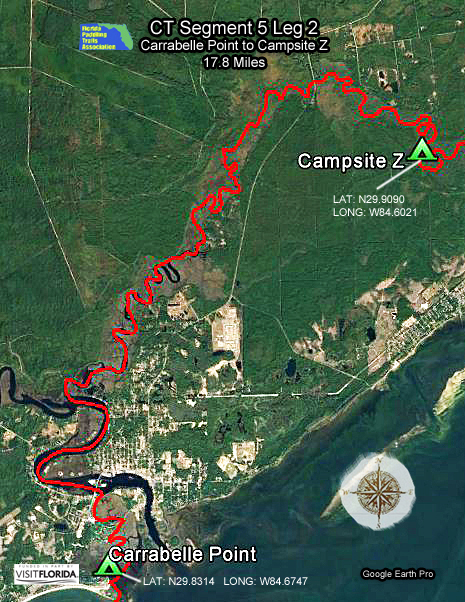 Other paddling trails include the Econlockhatchee and part of the upper St. Johns River. Contact: Contact our Region O Director or Trailkeeper for more information by clicking here. Emerging from busy Orlando, the tannin-tinted Shingle Creek marks the beginning of the Everglades system. It feeds into the massive Lake Toho, the first of several lakes that are connected by either canals or natural passageways. 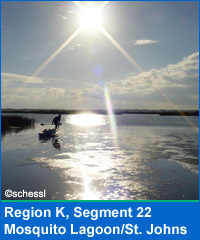 Eventually, the lakes feed into the Kissimmee River and then Lake Okeechobee and the "River of Grass." Osceola County has been spearheading development of the 1,000-plus acre Shingle Creek Regional Park. Besides hiking and biking trails and historic buildings, the Shingle Creek Paddling Trail will eventually allow paddlers to access Lake Toho and the publicly-owned Makinson Island. 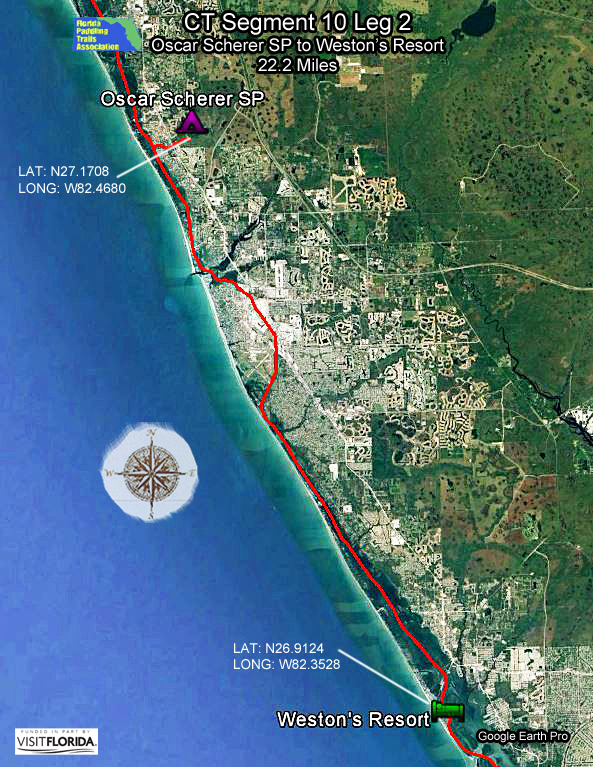 Long distance paddlers may wish to begin a multi-day trip all the way to Lake Okeechobee and beyond from Shingle Creek, camping at fish camps and on public land. The routes haven't been fully scoped out for long distance paddlers, but the opportunities are there. Reedy Creek and other area waterways offer other promising opportunities for paddlers.